Temple Sheckles Available In The Hallway! Romans 3: 1 What advantage then hath the Jew? Or what profit is there of circumcision? 2 Much in every way! 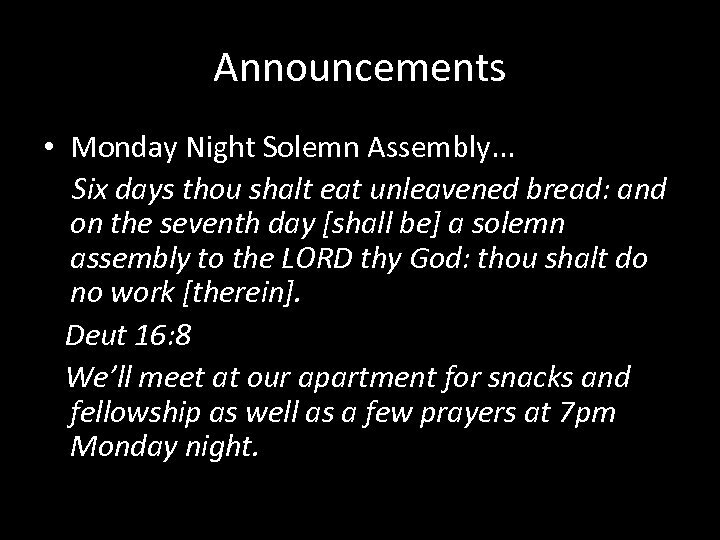 Announcements • Monday Night Solemn Assembly. . . Six days thou shalt eat unleavened bread: and on the seventh day [shall be] a solemn assembly to the LORD thy God: thou shalt do no work [therein]. Deut 16: 8 We’ll meet at our apartment for snacks and fellowship as well as a few prayers at 7 pm Monday night. Announcements • As most of you know, we have different positions in our Synagogue. One of those positions is the Captain of the Temple. 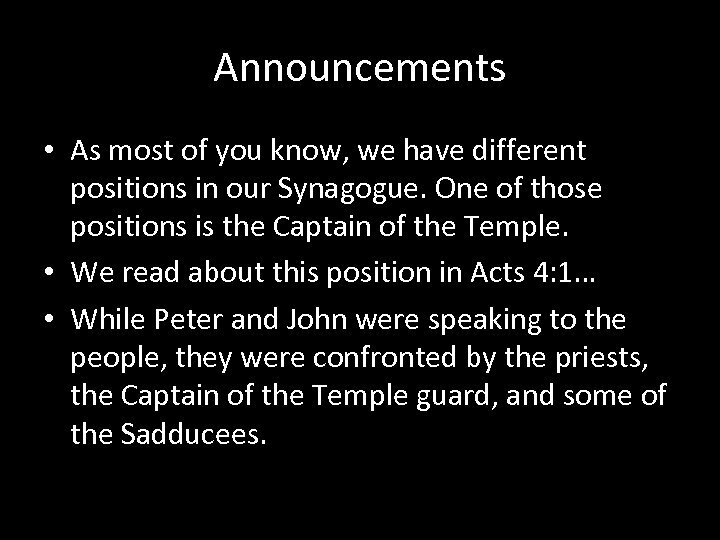 • We read about this position in Acts 4: 1… • While Peter and John were speaking to the people, they were confronted by the priests, the Captain of the Temple guard, and some of the Sadducees. 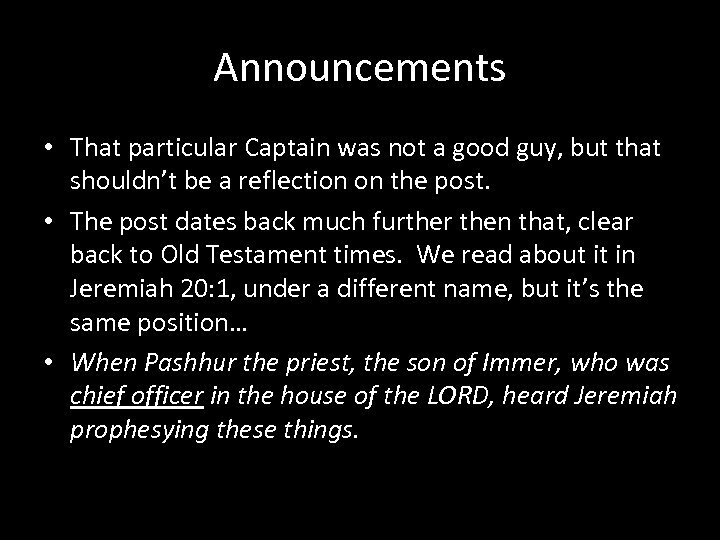 Announcements • That particular Captain was not a good guy, but that shouldn’t be a reflection on the post. 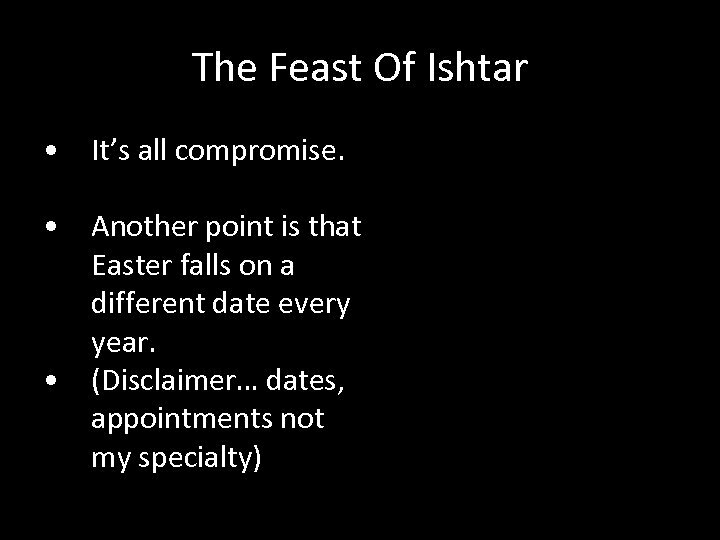 • The post dates back much further then that, clear back to Old Testament times. 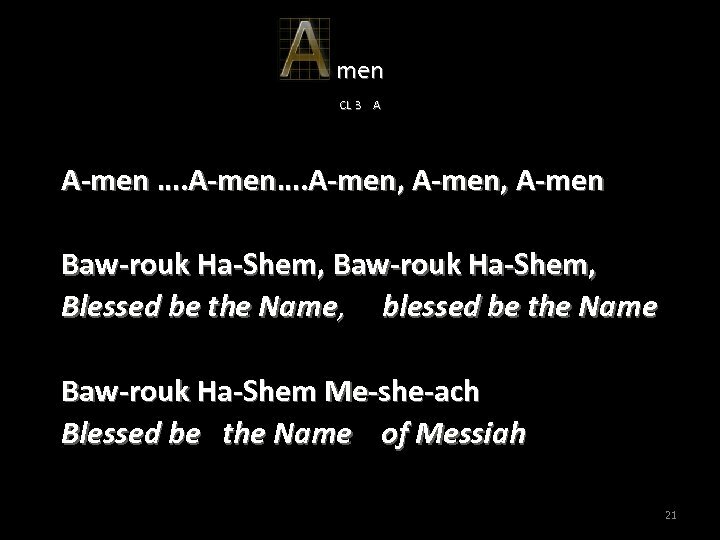 We read about it in Jeremiah 20: 1, under a different name, but it’s the same position… • When Pashhur the priest, the son of Immer, who was chief officer in the house of the LORD, heard Jeremiah prophesying these things. 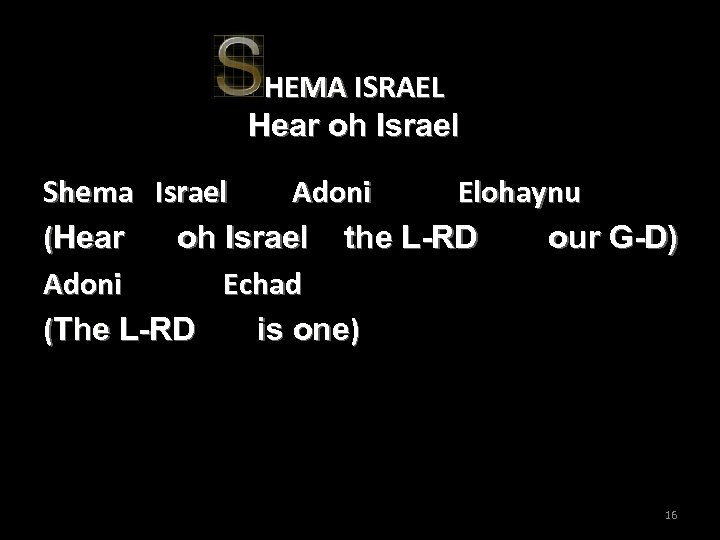 Announcements • We see another name it goes by in Neh 11: 11 where Seraiah held the position. 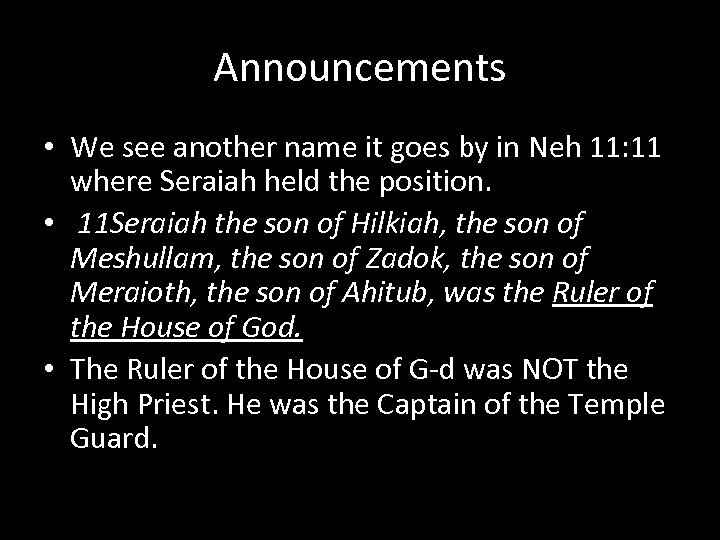 • 11 Seraiah the son of Hilkiah, the son of Meshullam, the son of Zadok, the son of Meraioth, the son of Ahitub, was the Ruler of the House of God. 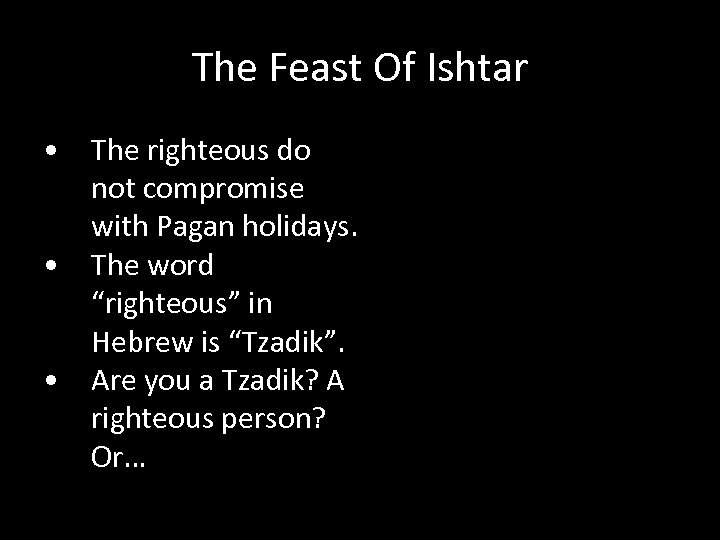 • The Ruler of the House of G-d was NOT the High Priest. He was the Captain of the Temple Guard. 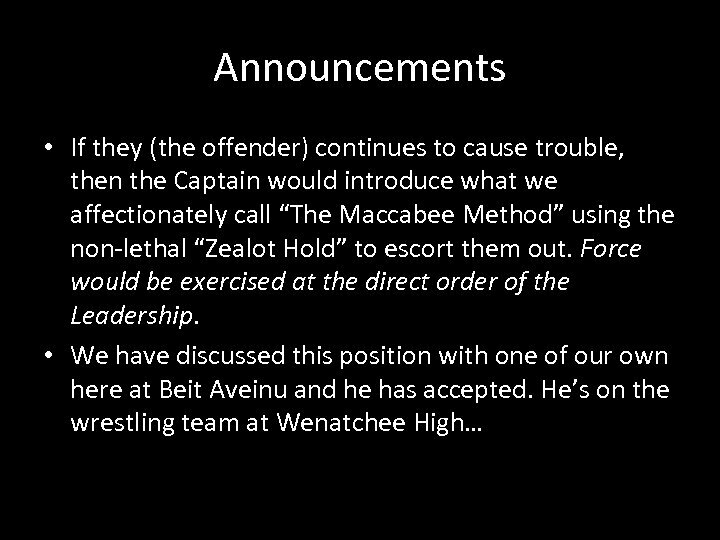 Announcements • This Captain was in charge of keeping the peace and making sure that policies were kept as prescribed by the rest of the leadership. 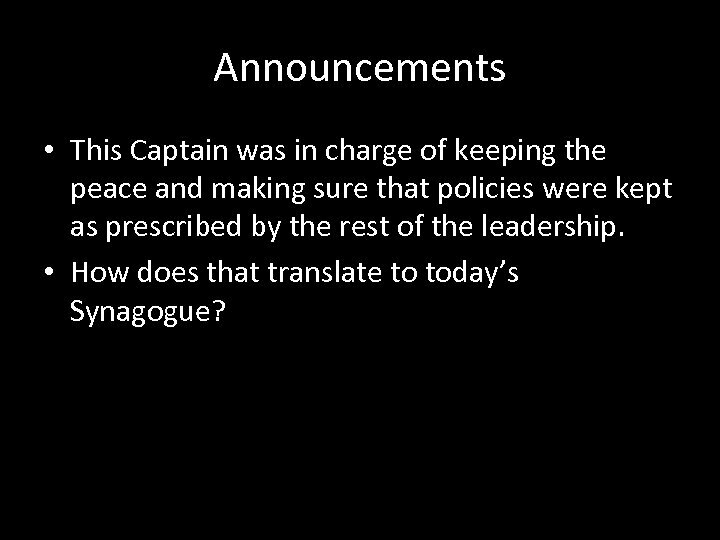 • How does that translate to today’s Synagogue? 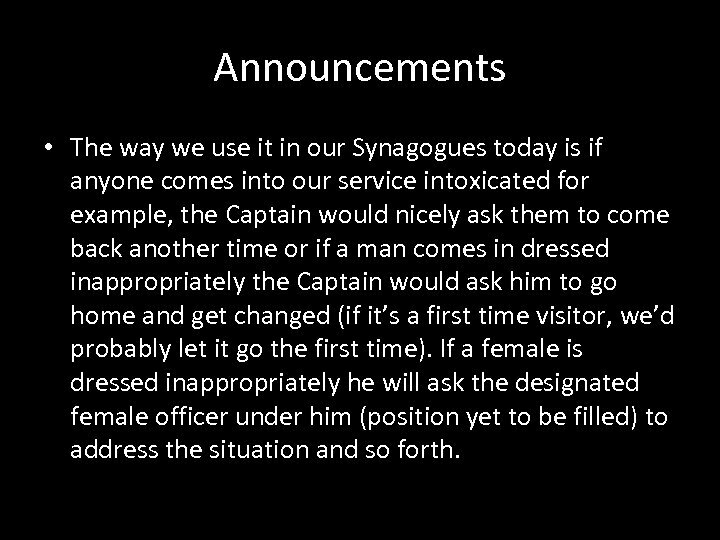 Announcements • The way we use it in our Synagogues today is if anyone comes into our service intoxicated for example, the Captain would nicely ask them to come back another time or if a man comes in dressed inappropriately the Captain would ask him to go home and get changed (if it’s a first time visitor, we’d probably let it go the first time). If a female is dressed inappropriately he will ask the designated female officer under him (position yet to be filled) to address the situation and so forth. Announcements • We want to welcome Aaron Huss to this position and we thank him for his dedication to this Body of Believers. His mom has given her permission for this appointment and is proud of his accomplishment. • Aaron is planning on being on the police force in the future and we feel this is a logical step towards his secular goals as well as his spiritual goals. • We want to welcome him aboard. 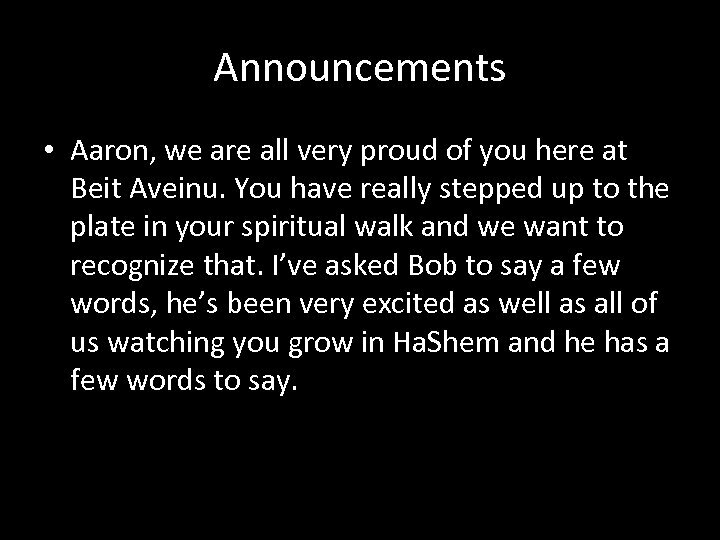 Announcements • Aaron, we are all very proud of you here at Beit Aveinu. You have really stepped up to the plate in your spiritual walk and we want to recognize that. I’ve asked Bob to say a few words, he’s been very excited as well as all of us watching you grow in Ha. Shem and he has a few words to say. Announcements • One final announcement. This is Danni’s last Shabbat with us for a while. She moves every year at this time over to the other side of the mountains. We miss her every time she has to leave us. But she’ll be back. 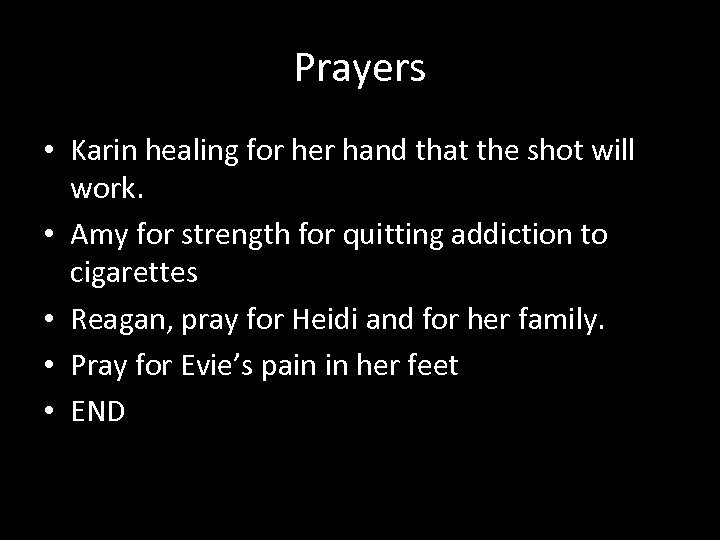 We look forward when she can come back and be with us. 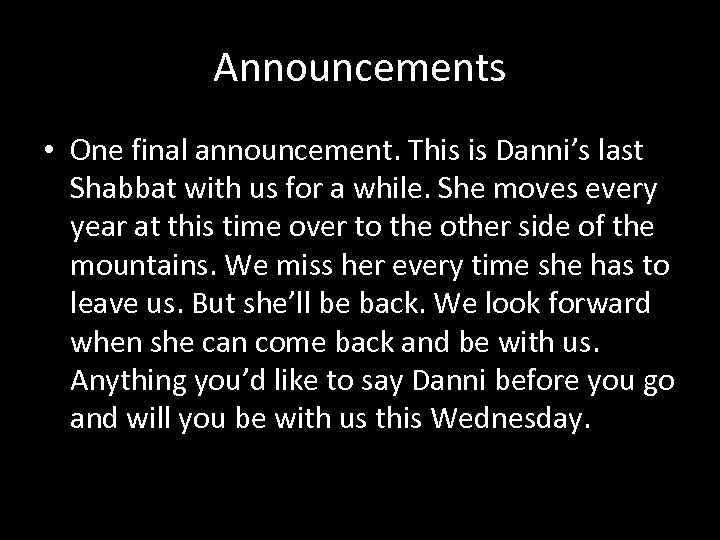 Anything you’d like to say Danni before you go and will you be with us this Wednesday. 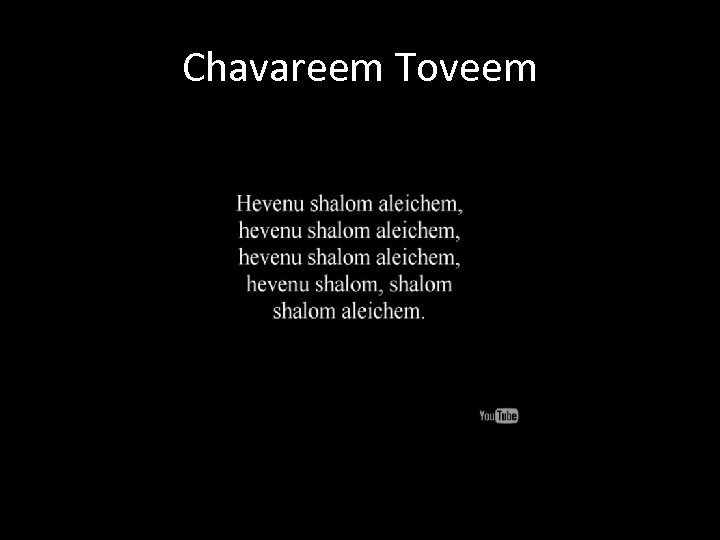 Chavareem Toveem! • Meet any new people. 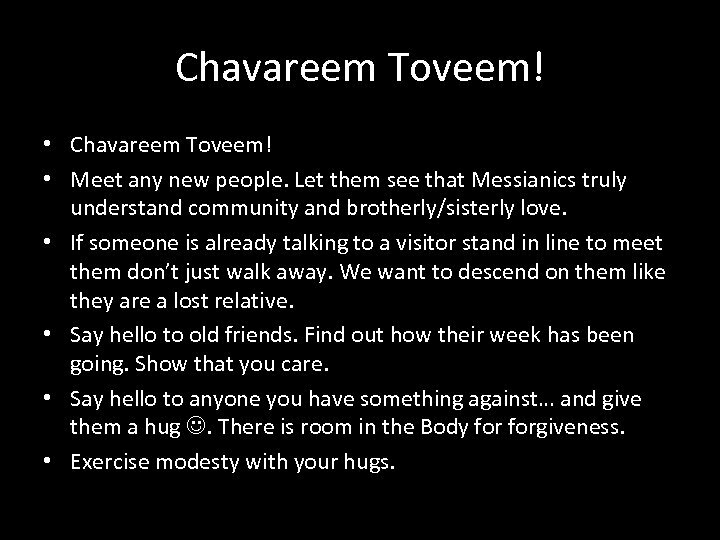 Let them see that Messianics truly understand community and brotherly/sisterly love. • If someone is already talking to a visitor stand in line to meet them don’t just walk away. We want to descend on them like they are a lost relative. • Say hello to old friends. 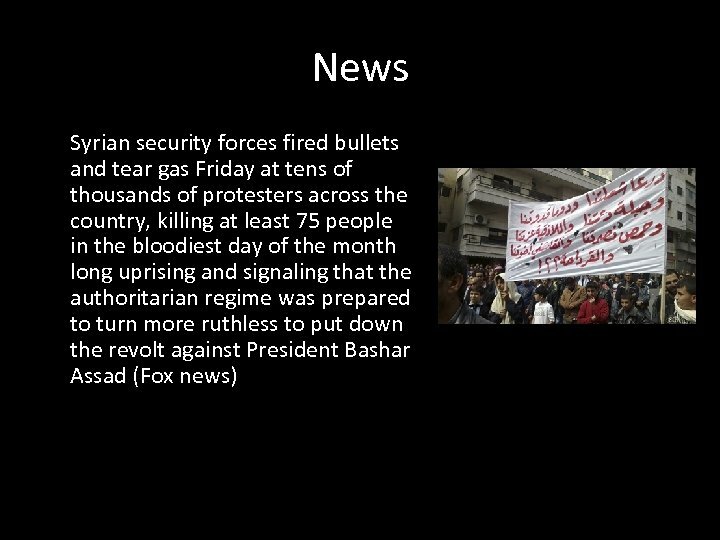 Find out how their week has been going. Show that you care. • Say hello to anyone you have something against… and give them a hug . There is room in the Body forgiveness. • Exercise modesty with your hugs. 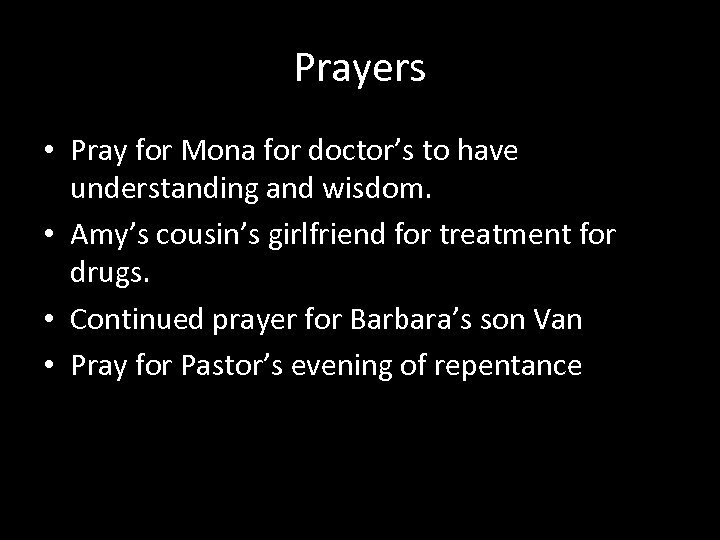 Prayers • Wayne’s friend Ariel and Steve for health • Karin’s Grandson for conviction of Mathew. 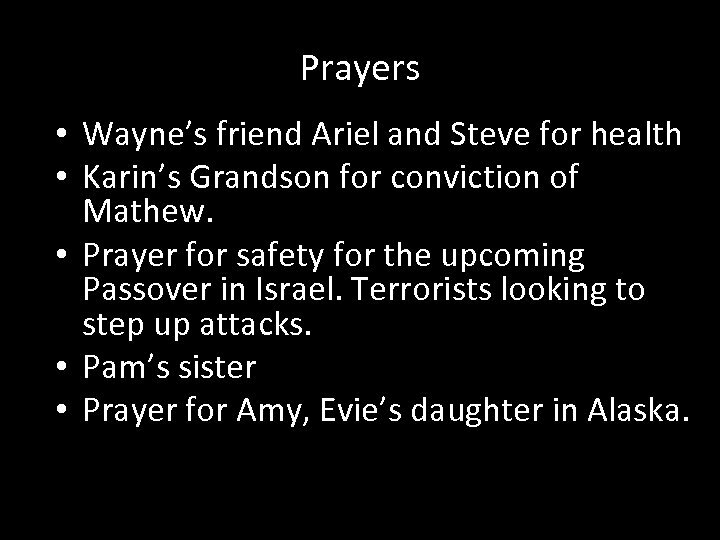 • Prayer for safety for the upcoming Passover in Israel. Terrorists looking to step up attacks. 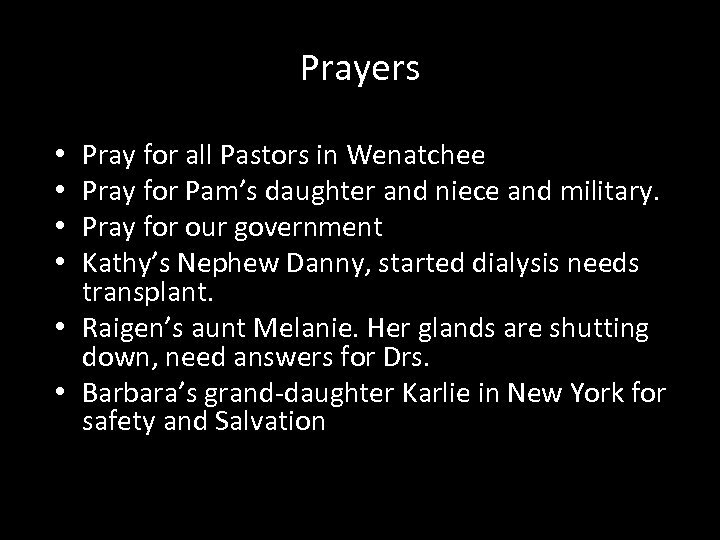 • Pam’s sister • Prayer for Amy, Evie’s daughter in Alaska. 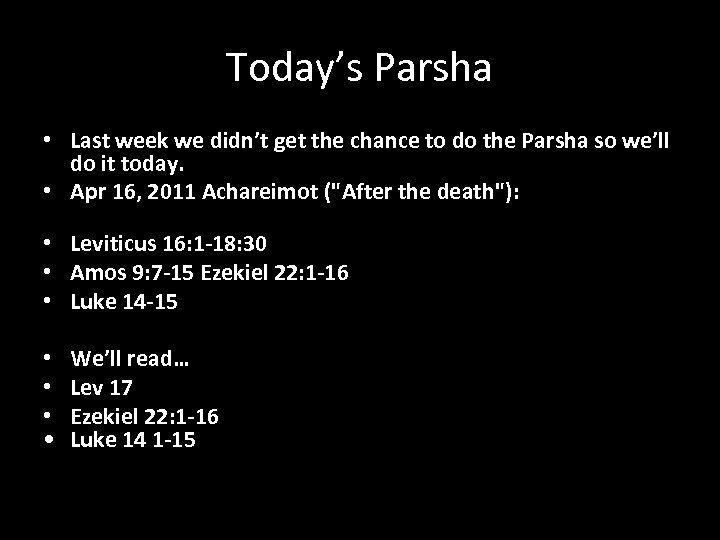 Lev 17 • 1 ADONAI said to Moshe, 2 "Speak to Aharon and his sons and to all the people of Isra'el. 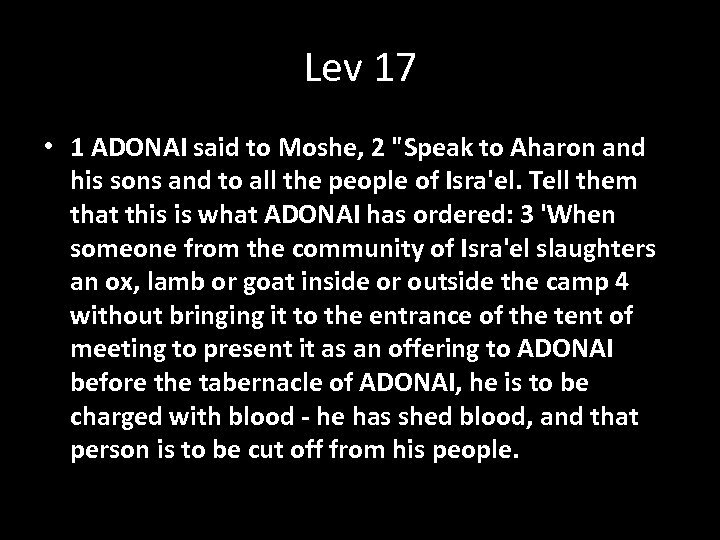 Tell them that this is what ADONAI has ordered: 3 'When someone from the community of Isra'el slaughters an ox, lamb or goat inside or outside the camp 4 without bringing it to the entrance of the tent of meeting to present it as an offering to ADONAI before the tabernacle of ADONAI, he is to be charged with blood - he has shed blood, and that person is to be cut off from his people. 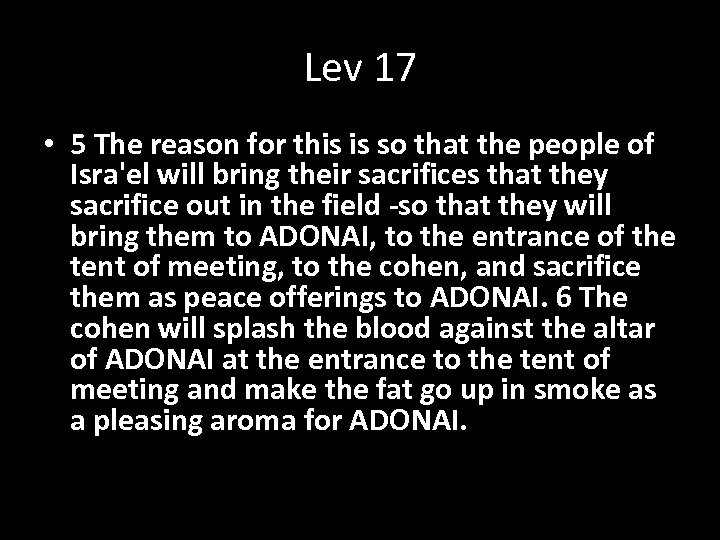 Lev 17 • 5 The reason for this is so that the people of Isra'el will bring their sacrifices that they sacrifice out in the field -so that they will bring them to ADONAI, to the entrance of the tent of meeting, to the cohen, and sacrifice them as peace offerings to ADONAI. 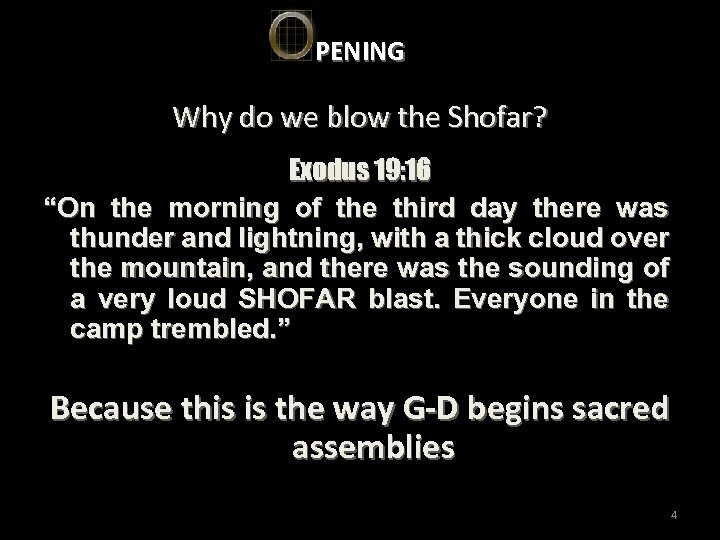 6 The cohen will splash the blood against the altar of ADONAI at the entrance to the tent of meeting and make the fat go up in smoke as a pleasing aroma for ADONAI. 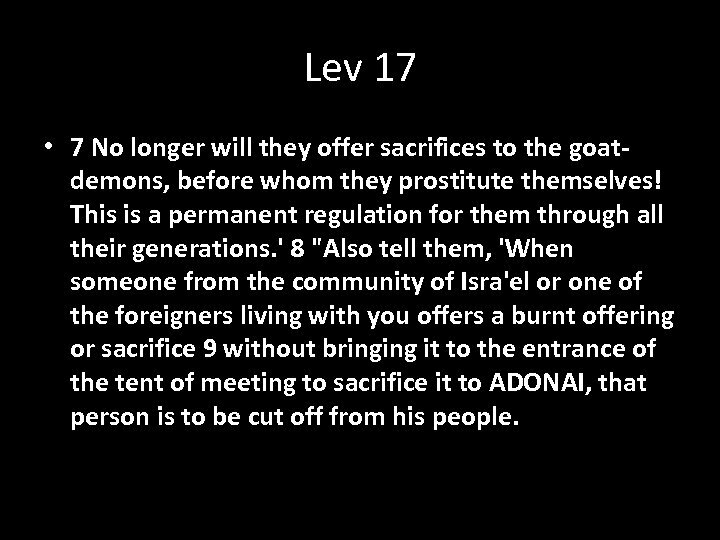 Lev 17 • 7 No longer will they offer sacrifices to the goatdemons, before whom they prostitute themselves! This is a permanent regulation for them through all their generations. ' 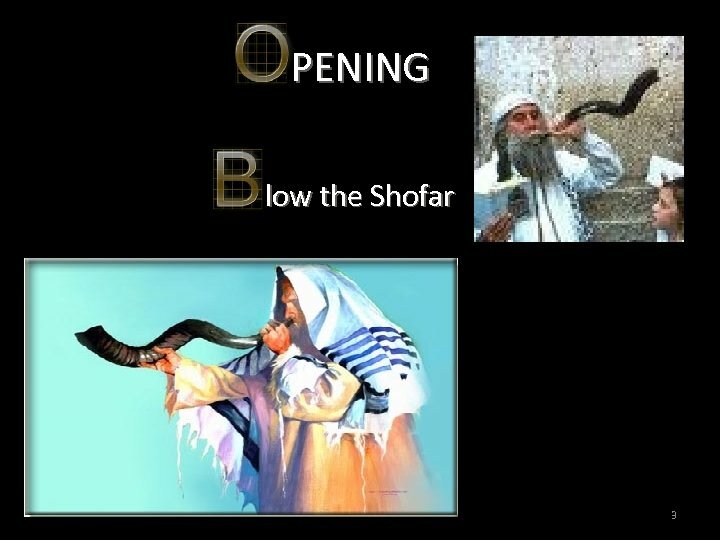 8 "Also tell them, 'When someone from the community of Isra'el or one of the foreigners living with you offers a burnt offering or sacrifice 9 without bringing it to the entrance of the tent of meeting to sacrifice it to ADONAI, that person is to be cut off from his people. 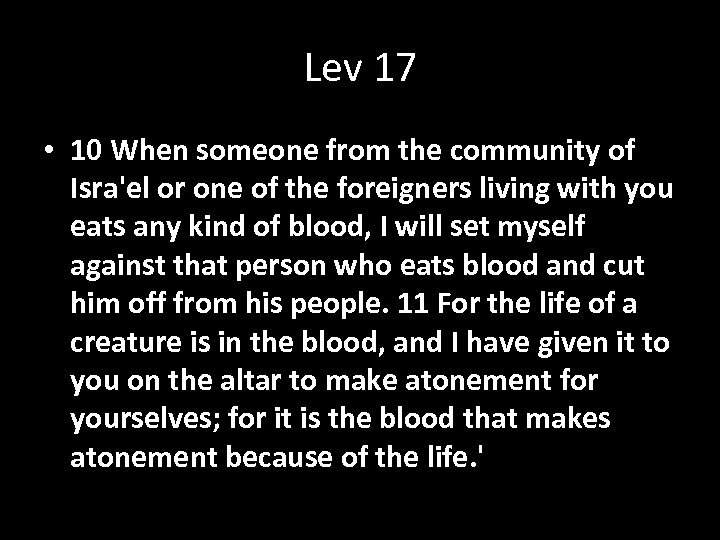 Lev 17 • 12 This is why I told the people of Isra'el, 'None of you is to eat blood, nor is any foreigner living with you to eat blood. ' 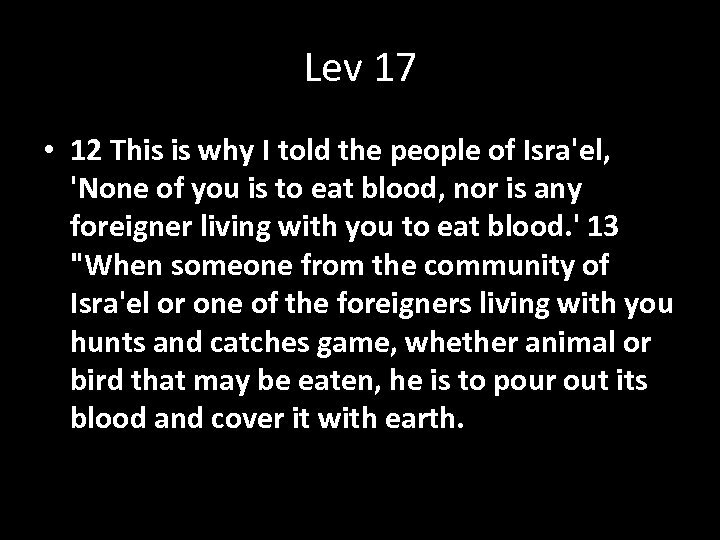 13 "When someone from the community of Isra'el or one of the foreigners living with you hunts and catches game, whether animal or bird that may be eaten, he is to pour out its blood and cover it with earth. 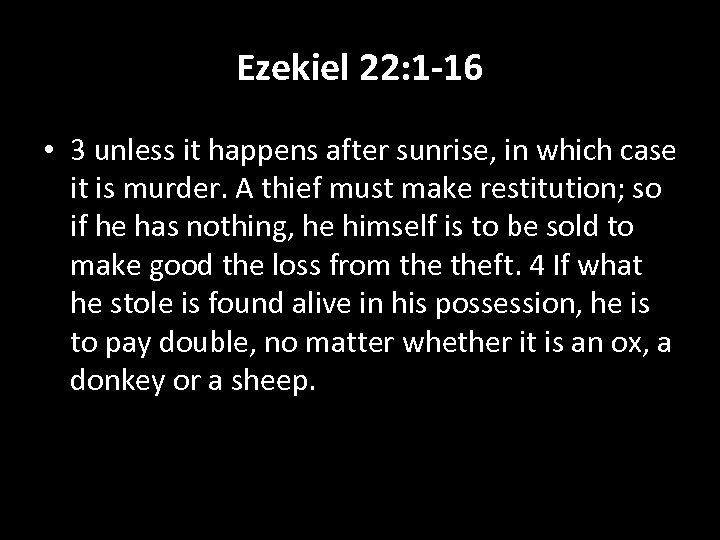 Ezekiel 22: 1 -16 • 3 unless it happens after sunrise, in which case it is murder. A thief must make restitution; so if he has nothing, he himself is to be sold to make good the loss from theft. 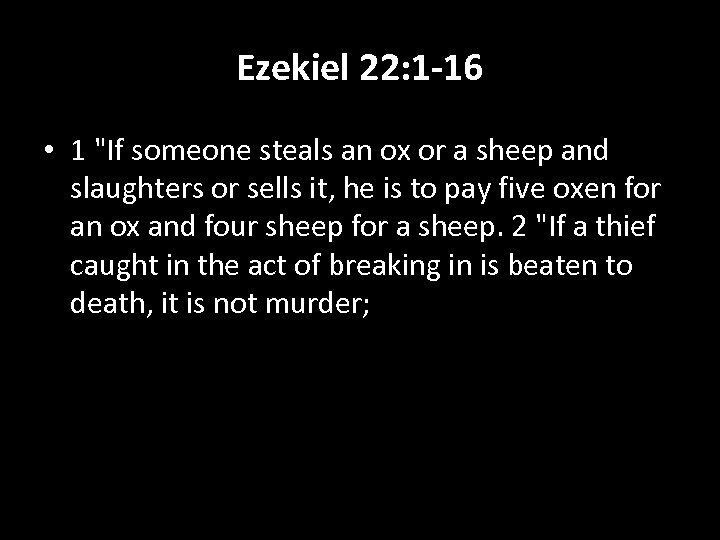 4 If what he stole is found alive in his possession, he is to pay double, no matter whether it is an ox, a donkey or a sheep. 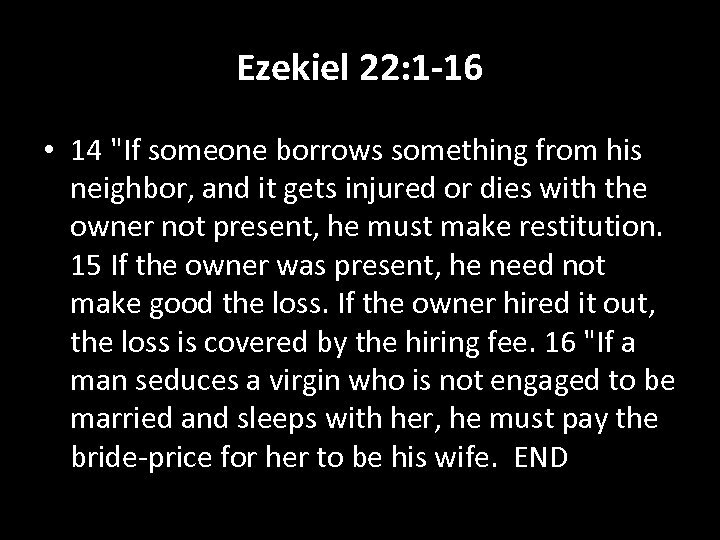 Ezekiel 22: 1 -16 • 5 "If a person causes a field or vineyard to be grazed over or lets his animal loose to graze in someone else's field, he is to make restitution from the best produce of his own field and vineyard. 6 "If a fire is started and spreads to thorns, so that stacked grain, standing grain or a field is destroyed, the person who lit it must make restitution. 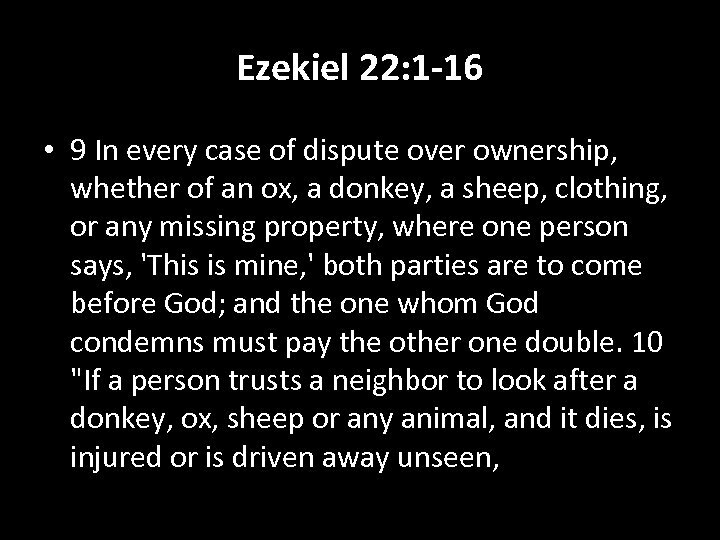 7 "If a person entrusts a neighbor with money or goods, and they are stolen from the trustee's house, then, if the thief is found, he must pay double. 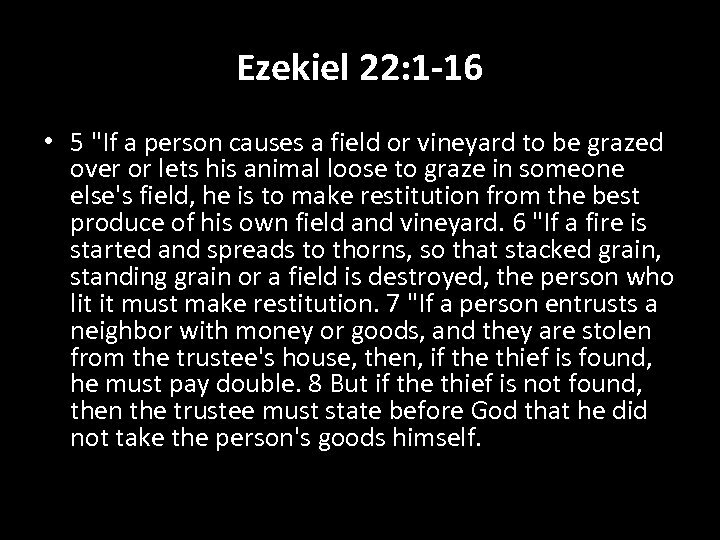 8 But if the thief is not found, then the trustee must state before God that he did not take the person's goods himself. 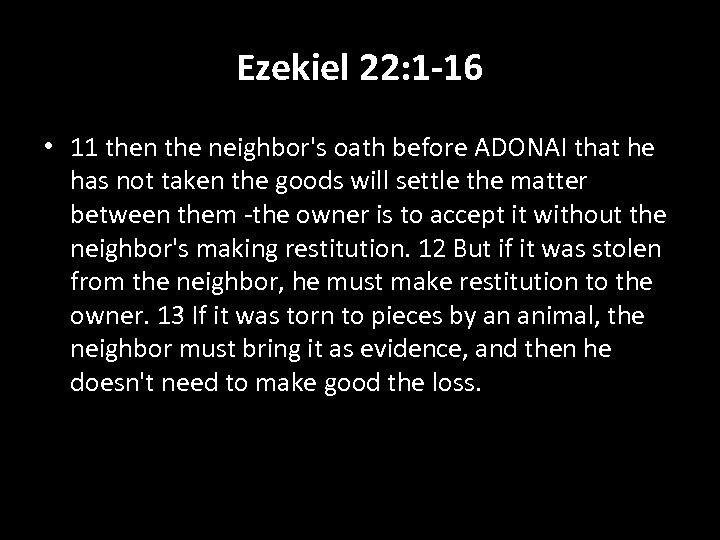 Ezekiel 22: 1 -16 • 11 then the neighbor's oath before ADONAI that he has not taken the goods will settle the matter between them -the owner is to accept it without the neighbor's making restitution. 12 But if it was stolen from the neighbor, he must make restitution to the owner. 13 If it was torn to pieces by an animal, the neighbor must bring it as evidence, and then he doesn't need to make good the loss. 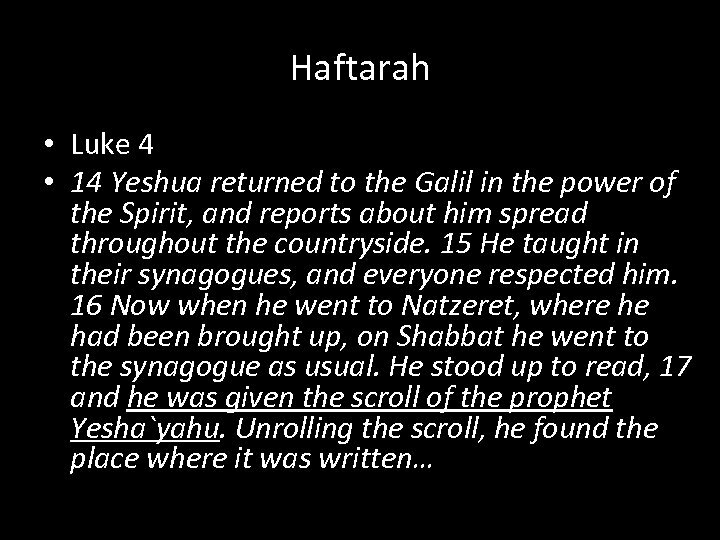 Haftarah • Why do we do the Haftarah? • Isn’t that just a Jewish thing? 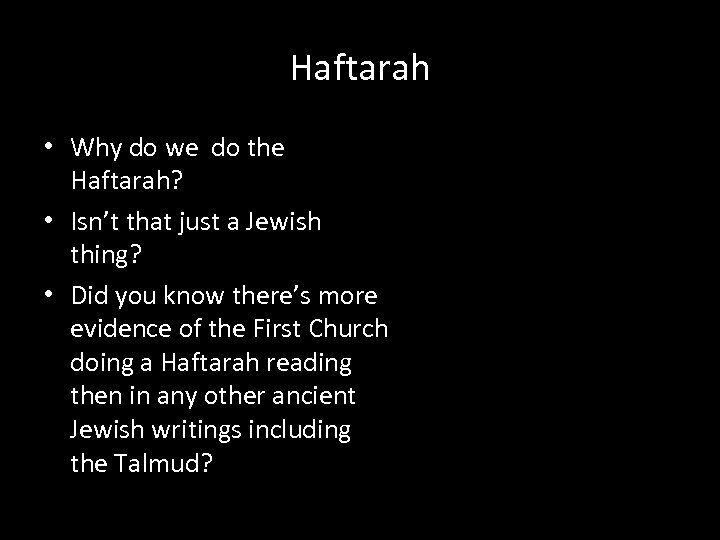 • Did you know there’s more evidence of the First Church doing a Haftarah reading then in any other ancient Jewish writings including the Talmud? 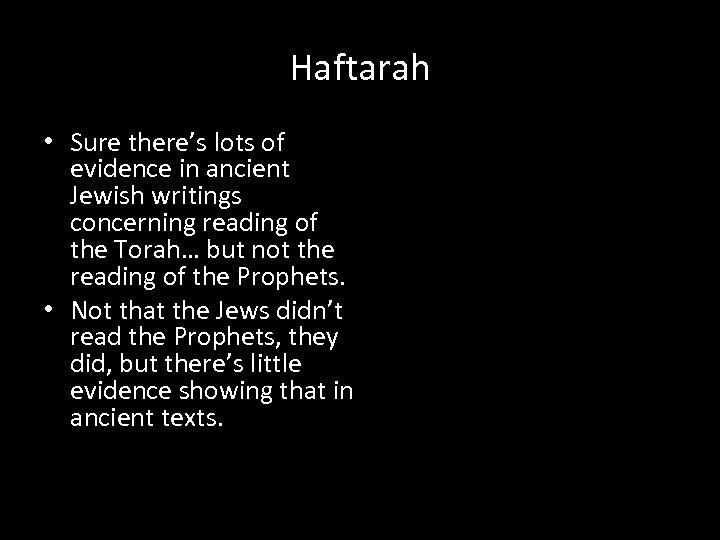 Haftarah • Sure there’s lots of evidence in ancient Jewish writings concerning reading of the Torah… but not the reading of the Prophets. 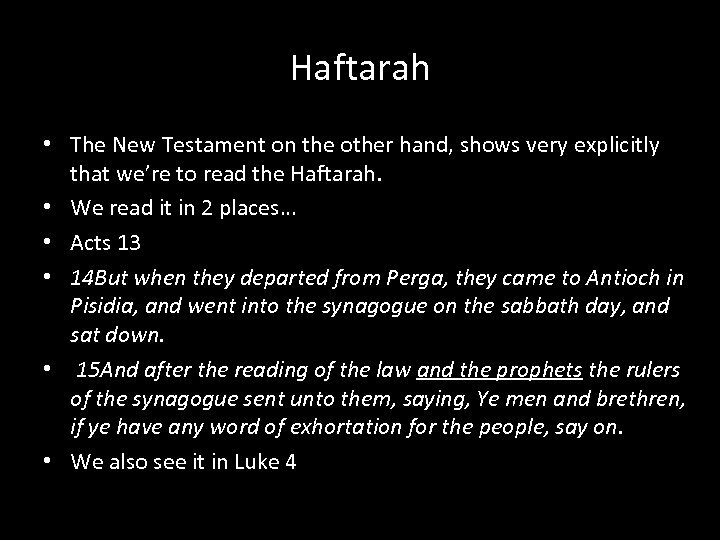 • Not that the Jews didn’t read the Prophets, they did, but there’s little evidence showing that in ancient texts. 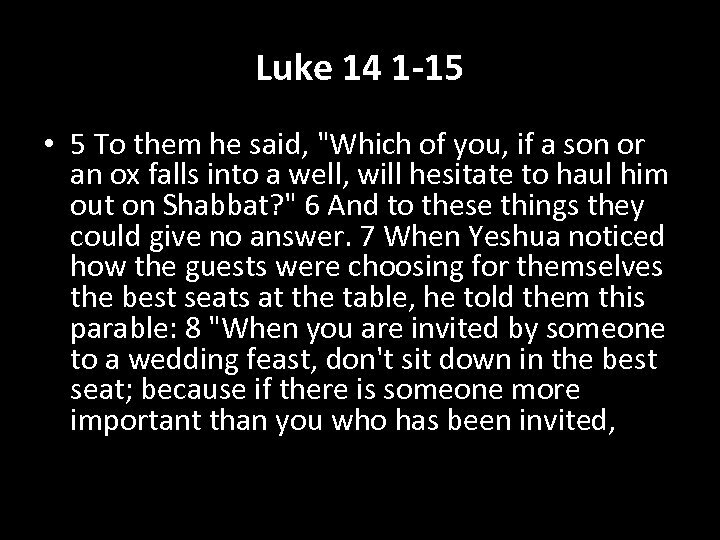 Luke 14 1 -15 • 1 One Shabbat Yeshua went to eat in the home of one of the leading P'rushim, and they were watching him closely. 2 In front of him was a man whose body was swollen with fluid. 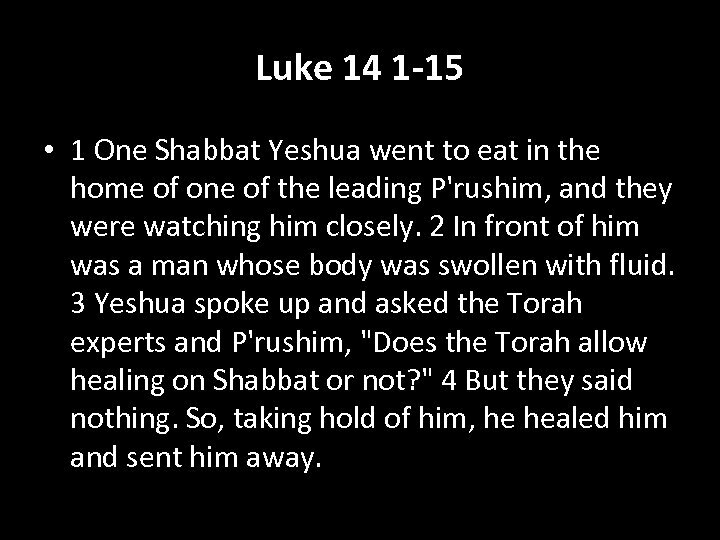 3 Yeshua spoke up and asked the Torah experts and P'rushim, "Does the Torah allow healing on Shabbat or not? " 4 But they said nothing. So, taking hold of him, he healed him and sent him away. Luke 14 1 -15 • 9 the person who invited both of you might come and say to you, `Give this man your place. ' Then you will be humiliated as you go to take the least important place. 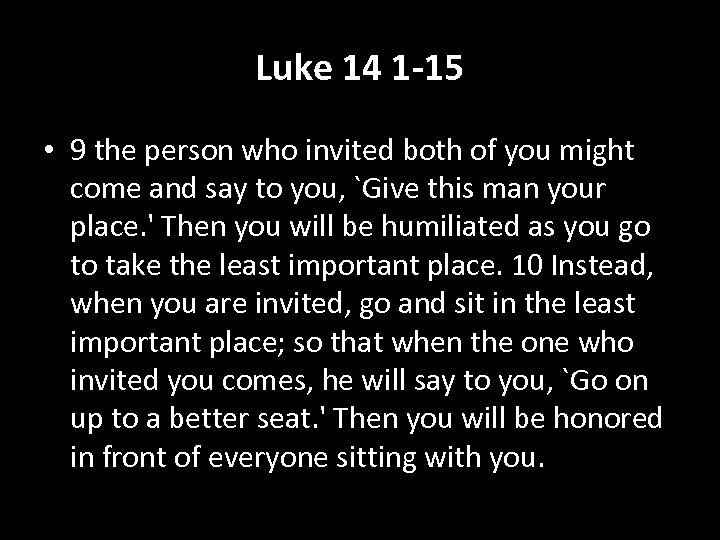 10 Instead, when you are invited, go and sit in the least important place; so that when the one who invited you comes, he will say to you, `Go on up to a better seat. ' Then you will be honored in front of everyone sitting with you. 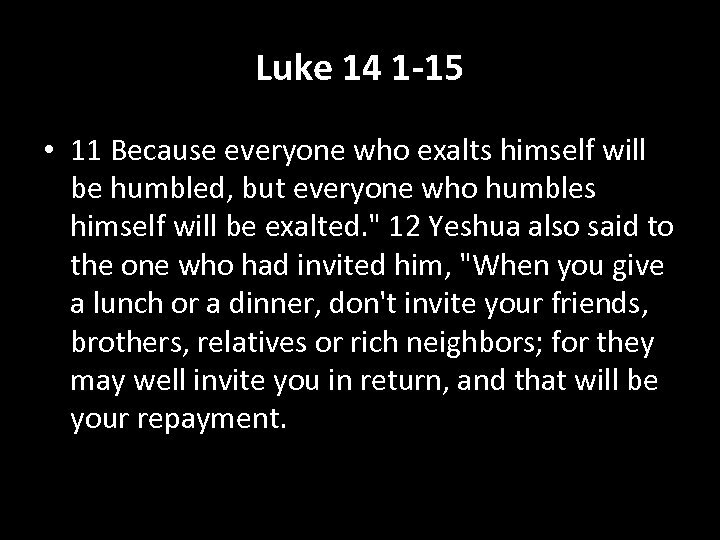 Luke 14 1 -15 • 11 Because everyone who exalts himself will be humbled, but everyone who humbles himself will be exalted. " 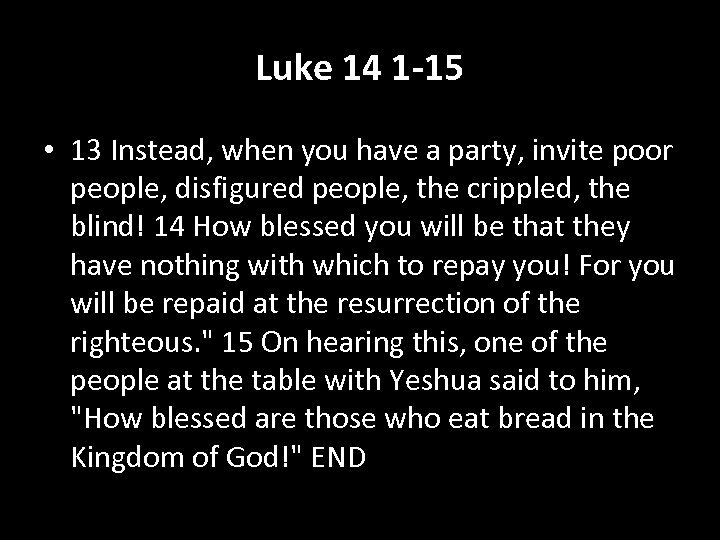 12 Yeshua also said to the one who had invited him, "When you give a lunch or a dinner, don't invite your friends, brothers, relatives or rich neighbors; for they may well invite you in return, and that will be your repayment. Noten Ha. 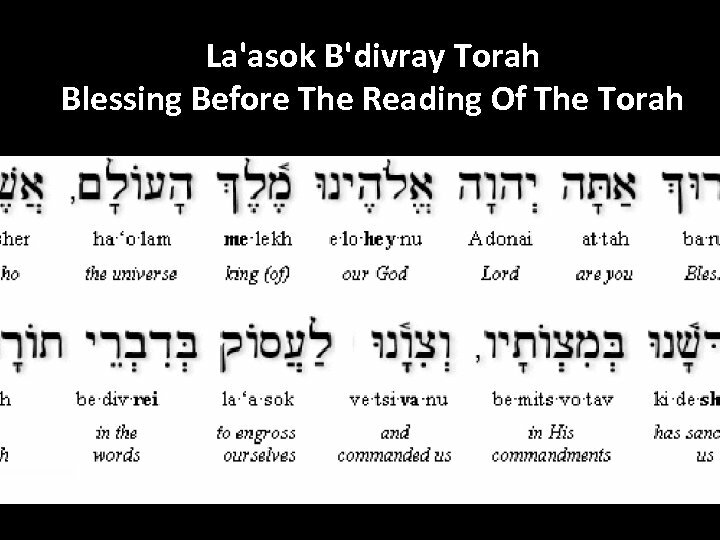 Torah • Baruch atah Adonay Eloheynu melech ha'olam, asher bachar banu mikol-ha'amim, venatan lanu et-torato. Baruch atah Adonay, noten hatorah. 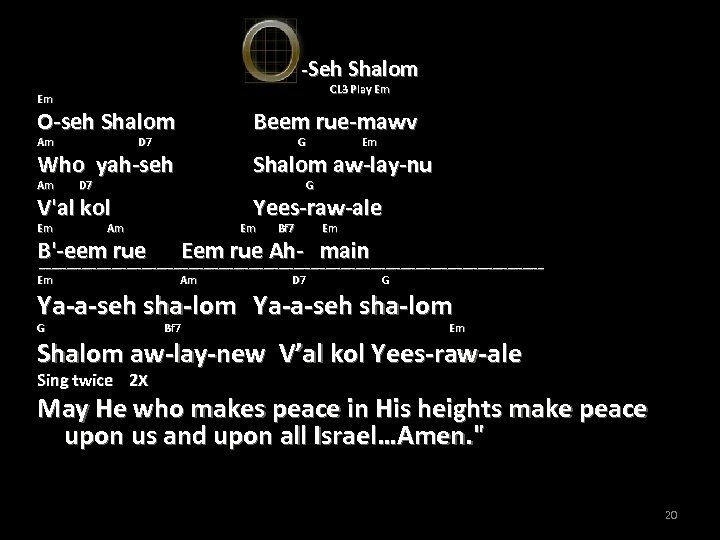 • Blessed are You, LORD our God, king of the universe, who chose us from all the peoples and gave to us His Torah. 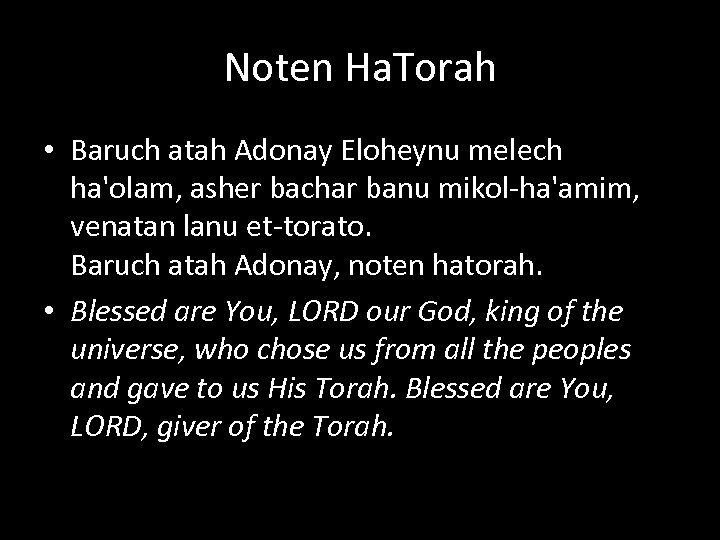 Blessed are You, LORD, giver of the Torah. 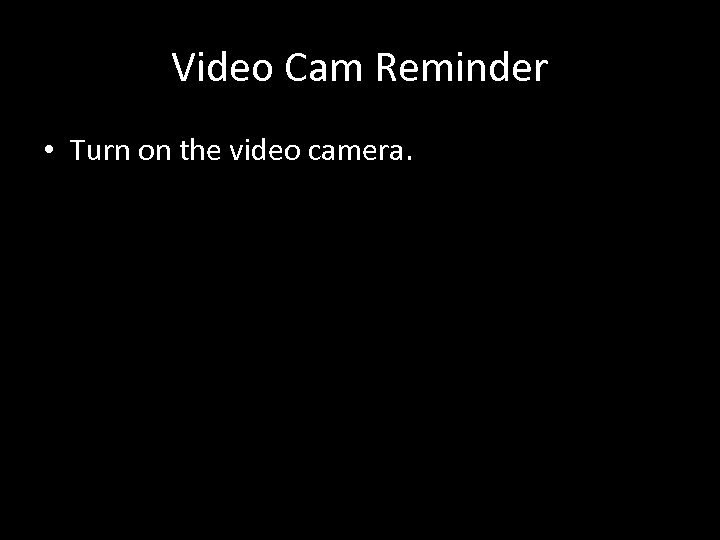 Video Cam Reminder • Turn on the video camera. 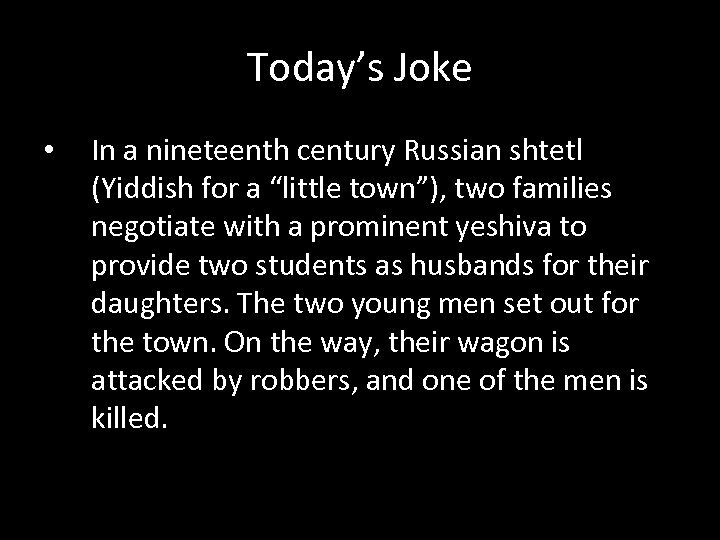 Today’s Joke • In a nineteenth century Russian shtetl (Yiddish for a “little town”), two families negotiate with a prominent yeshiva to provide two students as husbands for their daughters. The two young men set out for the town. On the way, their wagon is attacked by robbers, and one of the men is killed. 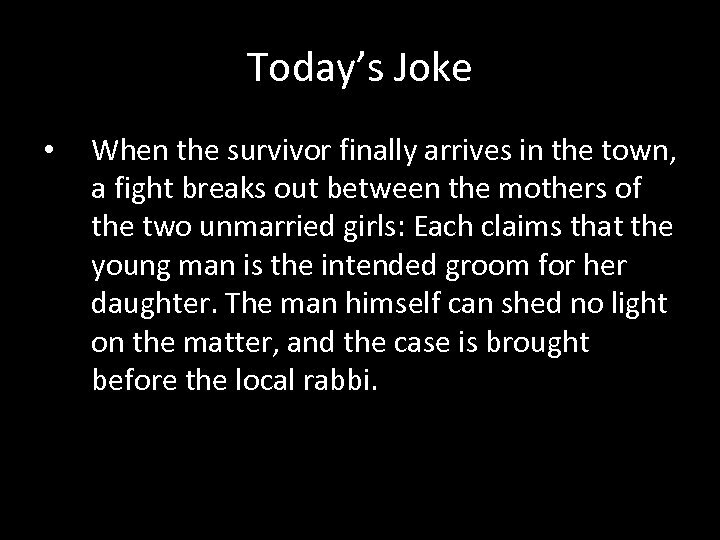 Today’s Joke • When the survivor finally arrives in the town, a fight breaks out between the mothers of the two unmarried girls: Each claims that the young man is the intended groom for her daughter. The man himself can shed no light on the matter, and the case is brought before the local rabbi. 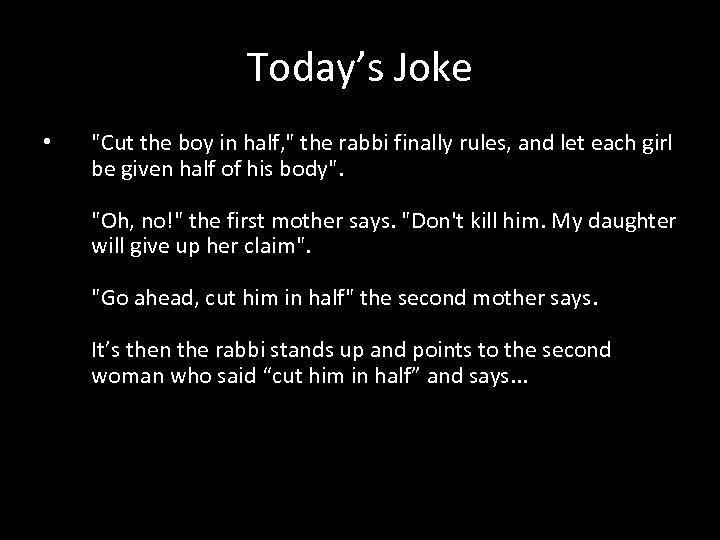 Today’s Joke • "Cut the boy in half, " the rabbi finally rules, and let each girl be given half of his body". "Oh, no!" the first mother says. "Don't kill him. My daughter will give up her claim". "Go ahead, cut him in half" the second mother says. It’s then the rabbi stands up and points to the second woman who said “cut him in half” and says. 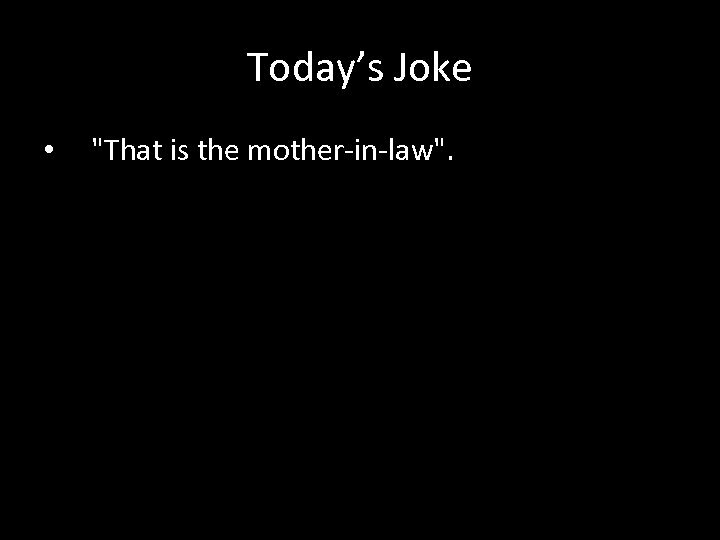 . .
Today’s Joke • "That is the mother-in-law". 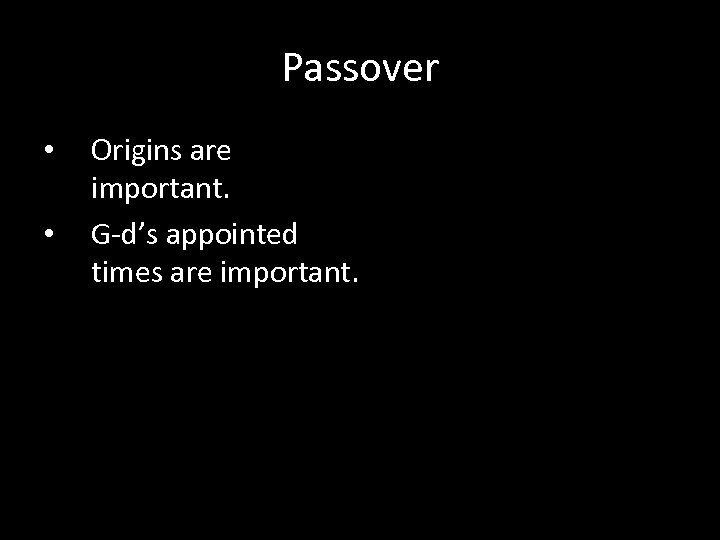 Passover • • Origins are important. G-d’s appointed times are important. 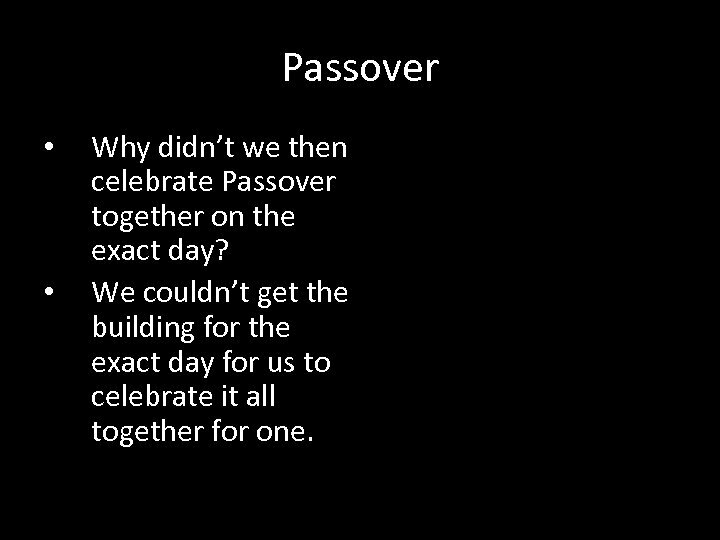 Passover • • Why didn’t we then celebrate Passover together on the exact day? We couldn’t get the building for the exact day for us to celebrate it all together for one. Passover • • • For two we still celebrated it at home on the exact day. We didn’t miss it. 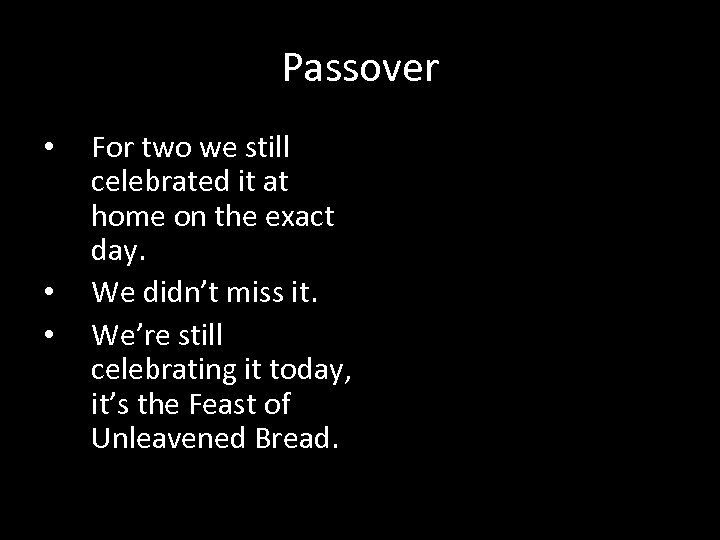 We’re still celebrating it today, it’s the Feast of Unleavened Bread. 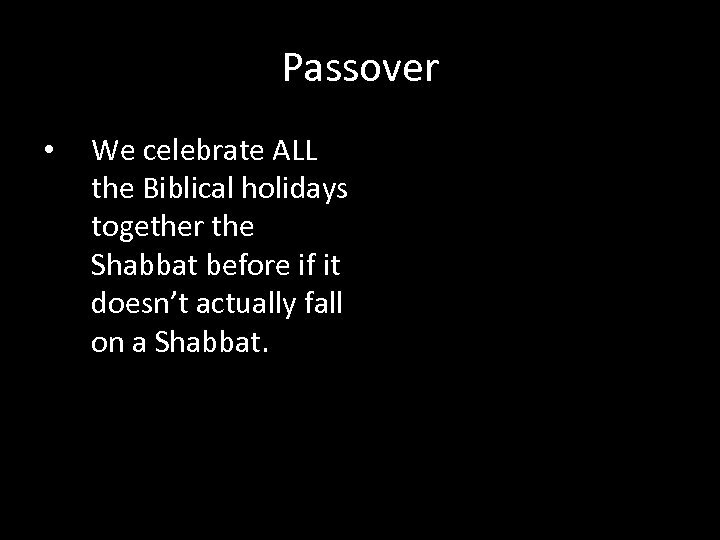 Passover • We celebrate ALL the Biblical holidays together the Shabbat before if it doesn’t actually fall on a Shabbat. 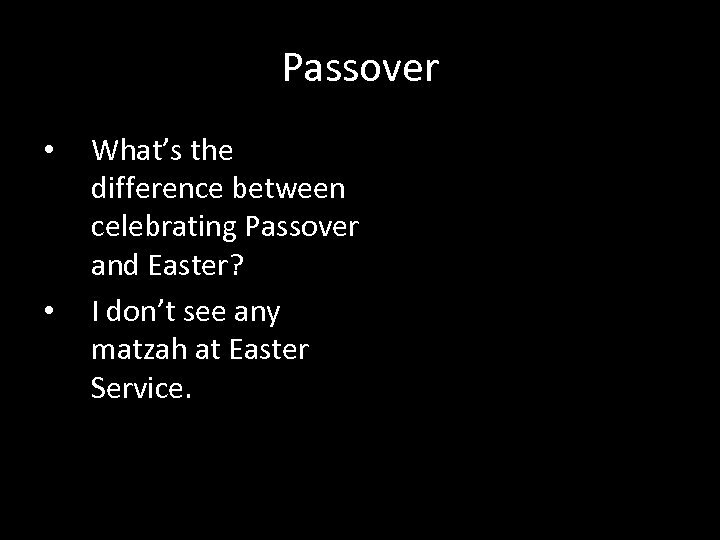 Passover • • What’s the difference between celebrating Passover and Easter? 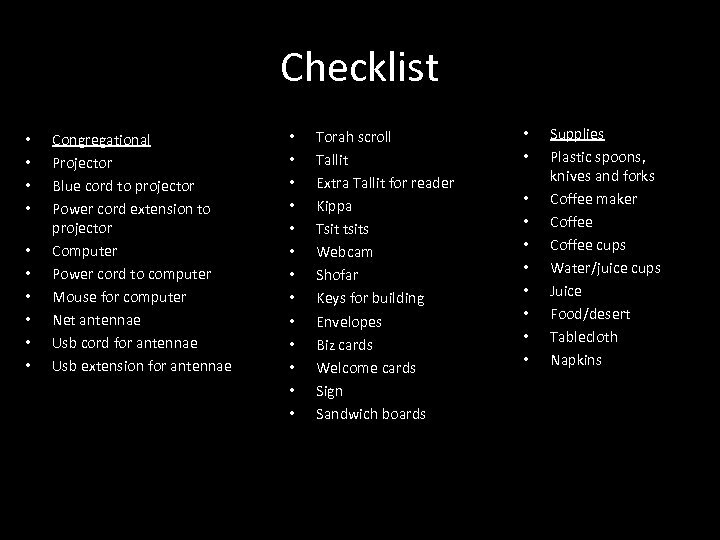 I don’t see any matzah at Easter Service. 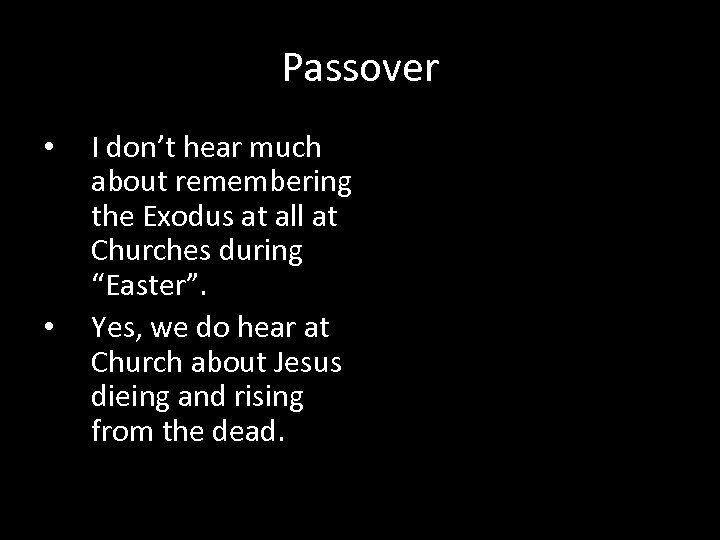 Passover • • I don’t hear much about remembering the Exodus at all at Churches during “Easter”. Yes, we do hear at Church about Jesus dieing and rising from the dead. 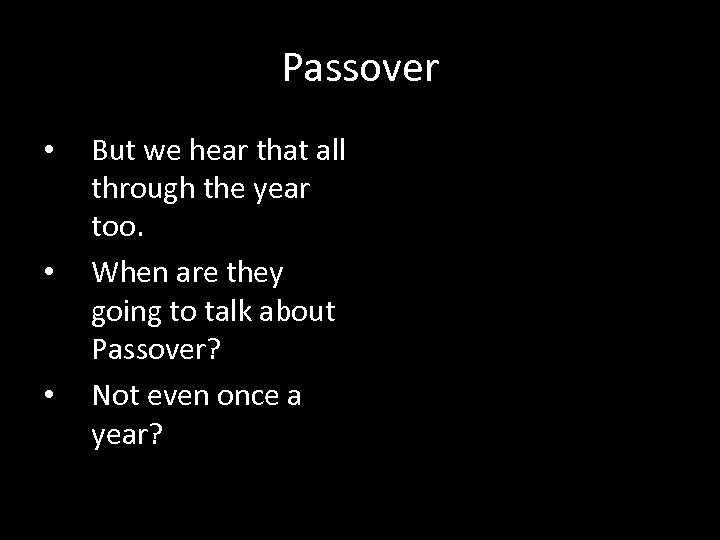 Passover • • • But we hear that all through the year too. When are they going to talk about Passover? Not even once a year? 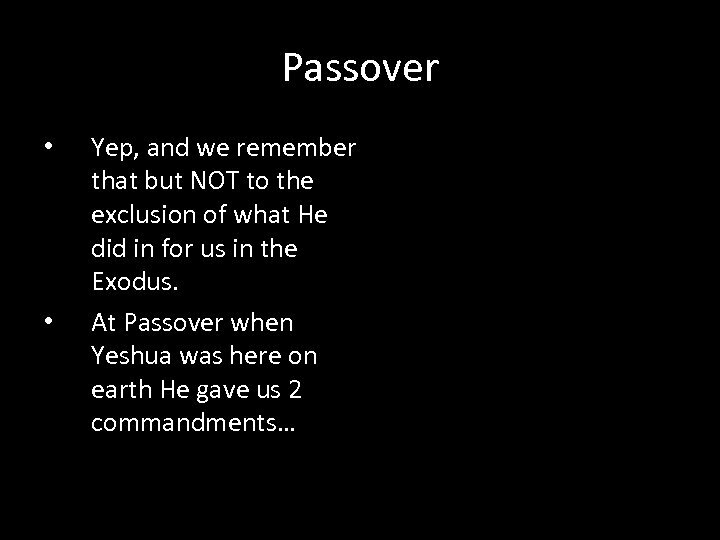 Passover • • • We do talk here at our congregation about Yeshua dieing for our sins. 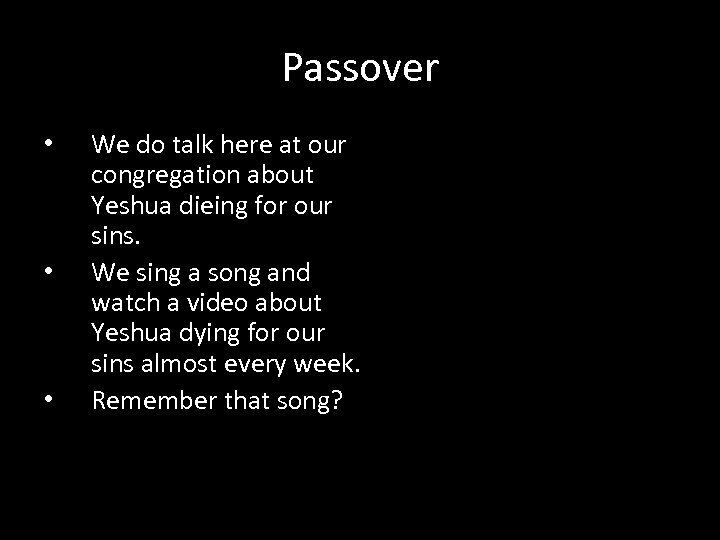 We sing a song and watch a video about Yeshua dying for our sins almost every week. Remember that song? Passover • • To remember Him and love each other as He loves us. 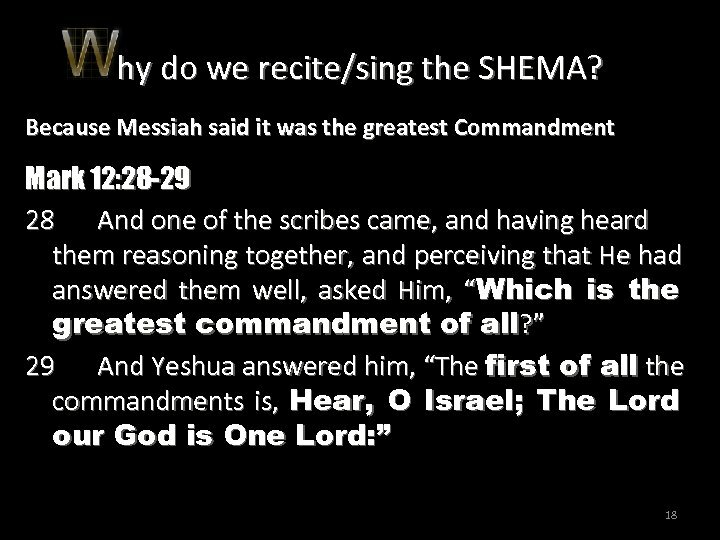 How many more commandments did He give us concerning Passover in the Tanach (Old Testament)? 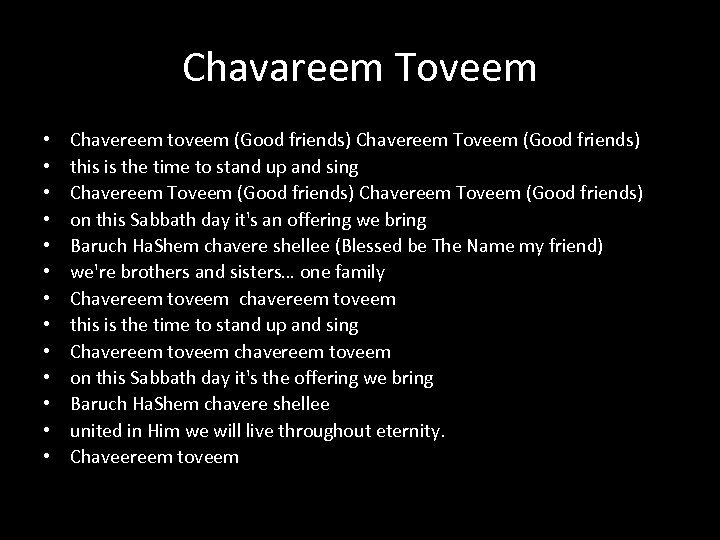 Passover 1. 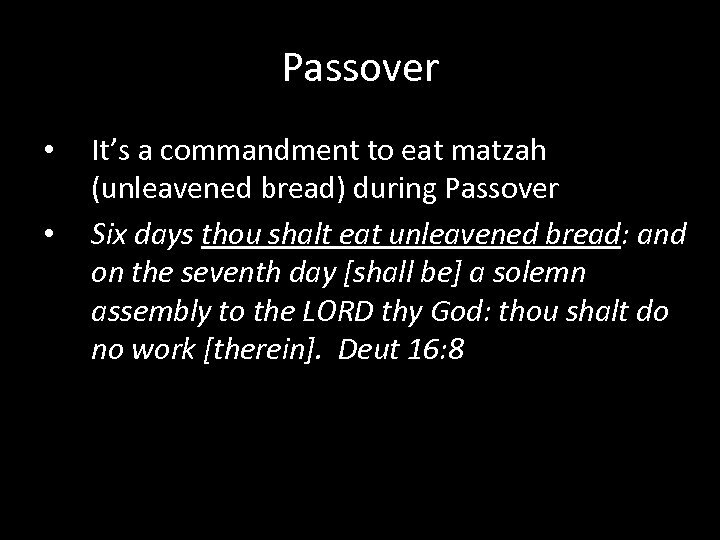 To eat unleavened bread. 2. Make a pilgrimage to the Temple (if we have one) 3. 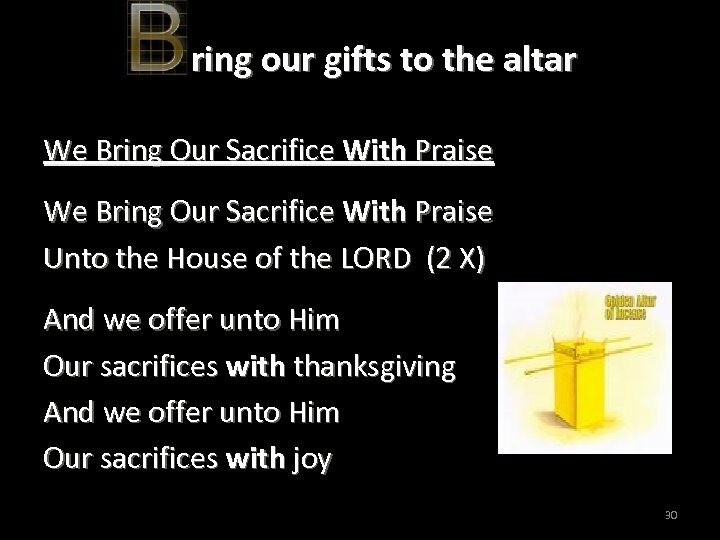 Sacrifice in the Temple (if we have one) 4. 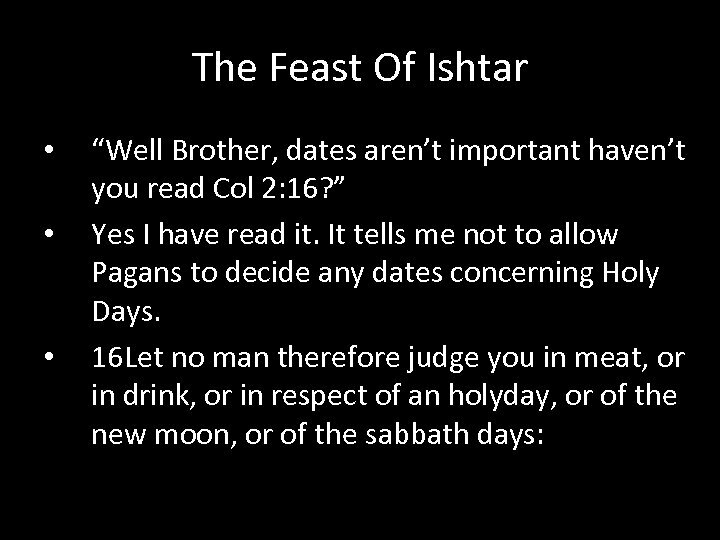 Deut 16: 12 Remember that you were slaves in Egypt, and follow carefully these decrees. Passover 4. Do no work on the 7 th day. 5. 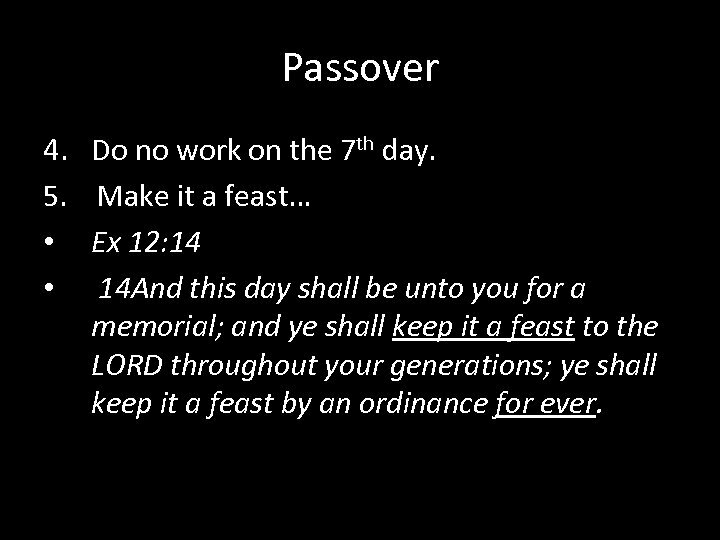 Make it a feast… • Ex 12: 14 • 14 And this day shall be unto you for a memorial; and ye shall keep it a feast to the LORD throughout your generations; ye shall keep it a feast by an ordinance for ever. 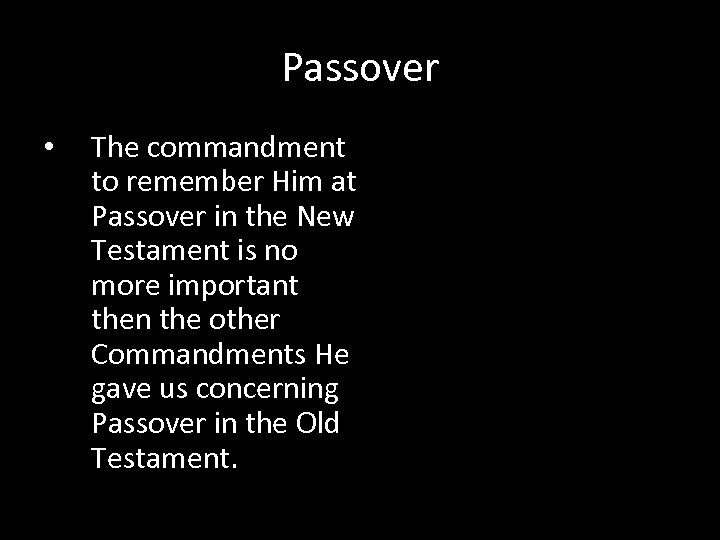 Passover • The commandment to remember Him at Passover in the New Testament is no more important then the other Commandments He gave us concerning Passover in the Old Testament. 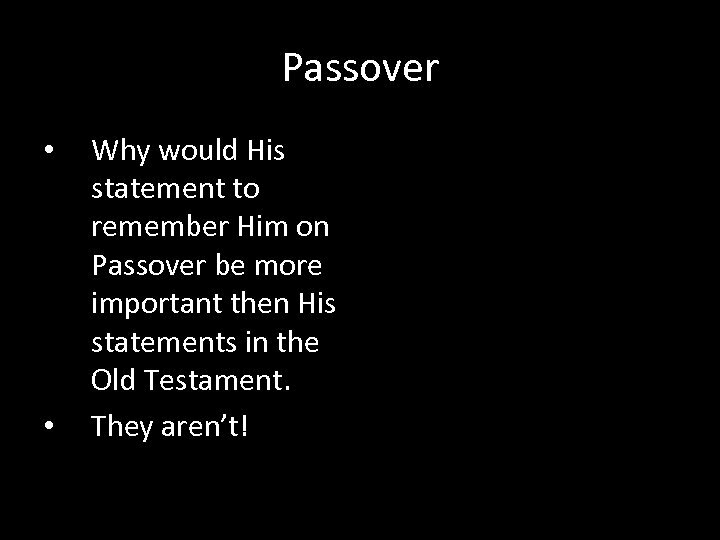 Passover • • Why would His statement to remember Him on Passover be more important then His statements in the Old Testament. They aren’t! 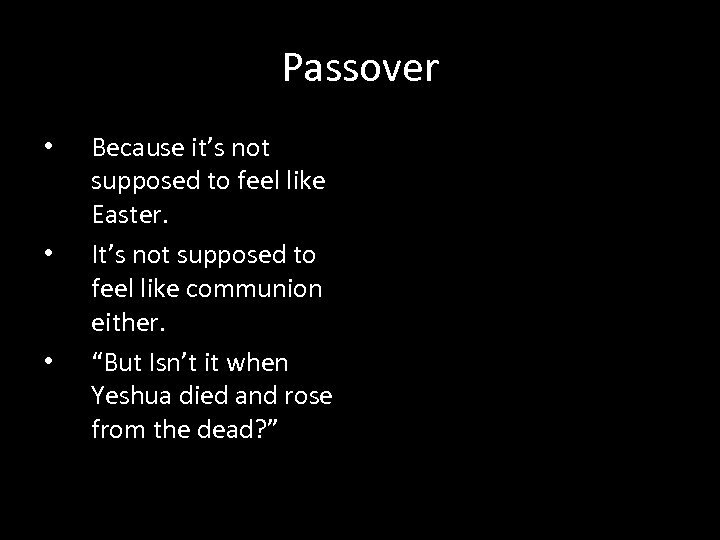 Passover • • • Yes, something WAS missing at our Passover service. Easter was missing! Communion was missing! Gentileism was missing. False warm fuzzy feelings were missing! 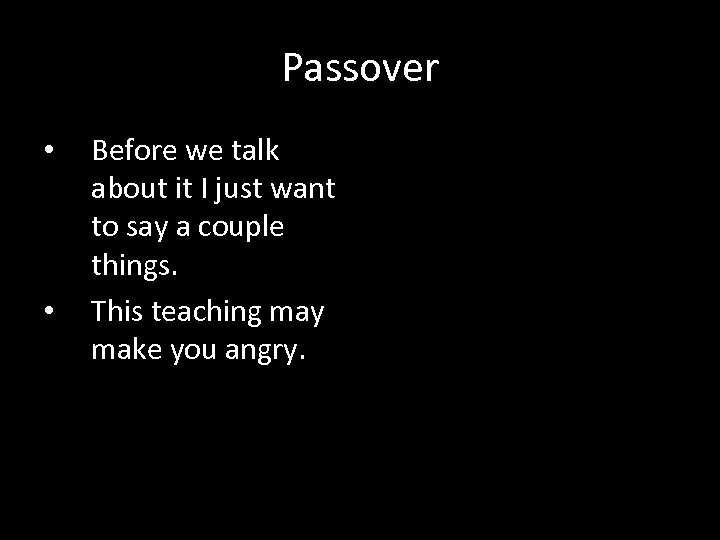 Passover • Messianics have warm fuzzy feelings but they are feelings that attract the spirit not the flesh. 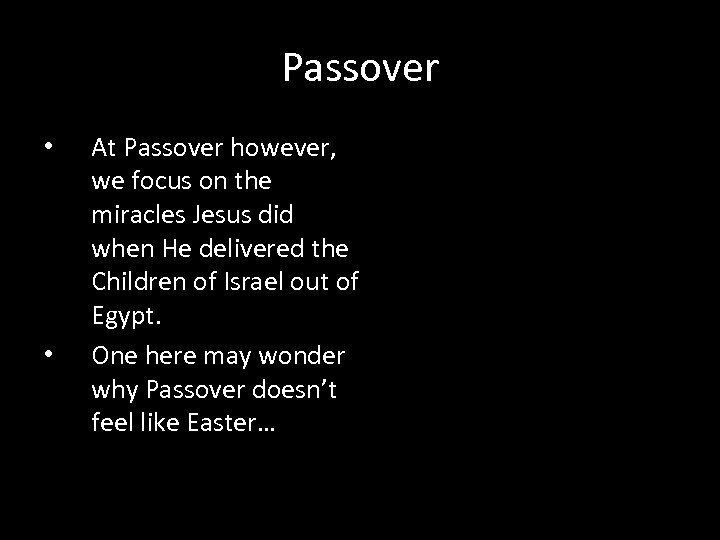 Passover • • • What wasn’t missing? 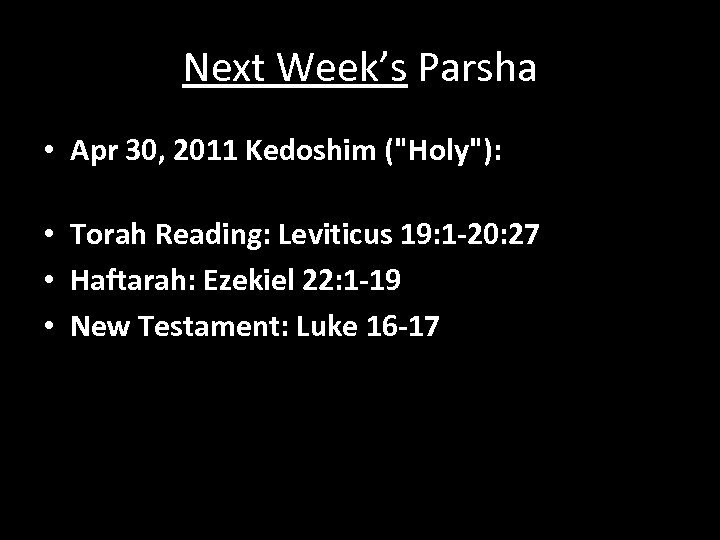 Yeshua wasn’t missing! 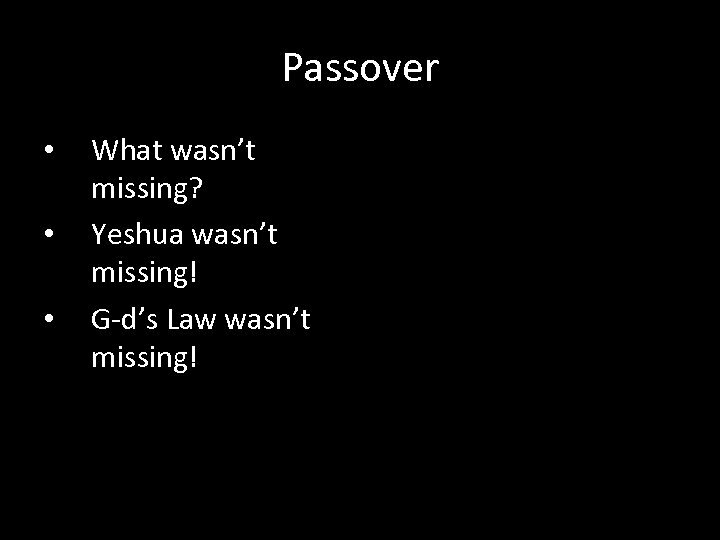 G-d’s Law wasn’t missing! 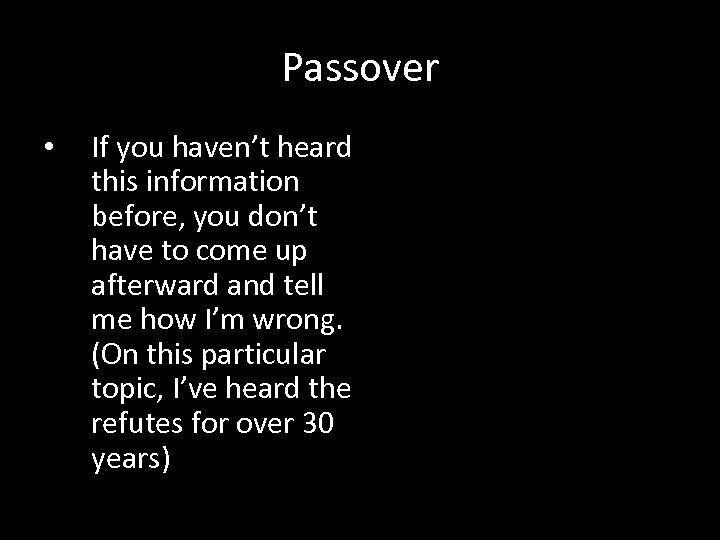 Passover • • The truth wasn’t missing! 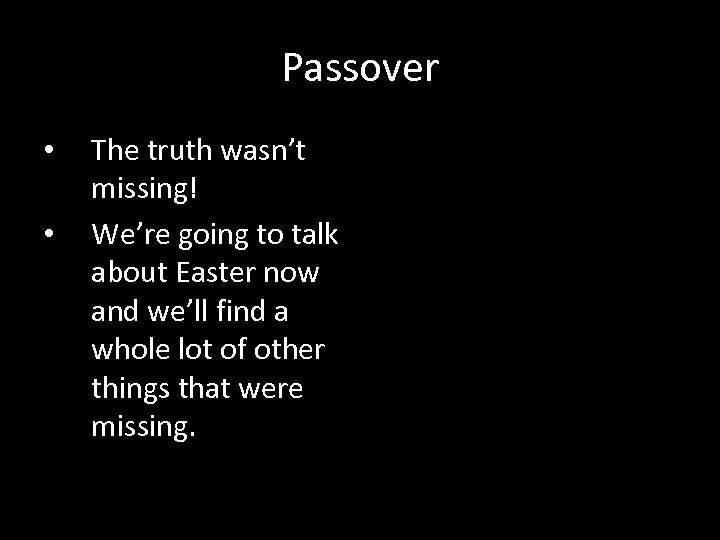 We’re going to talk about Easter now and we’ll find a whole lot of other things that were missing. Passover • • Before we talk about it I just want to say a couple things. This teaching may make you angry. 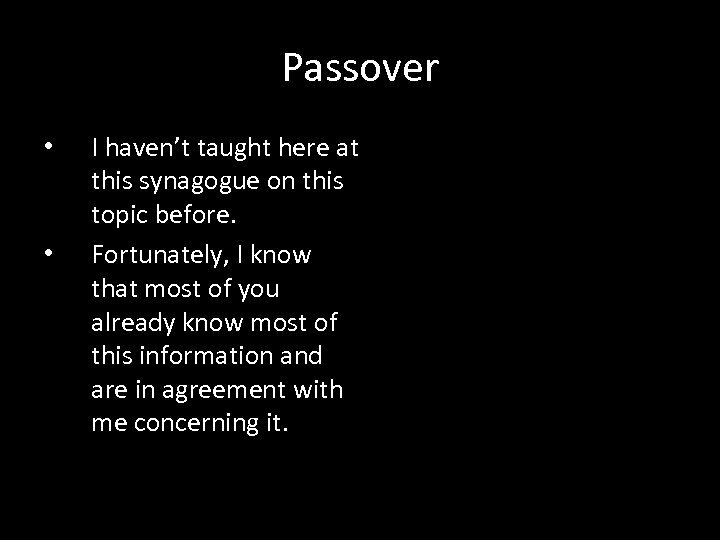 Passover • • I haven’t taught here at this synagogue on this topic before. Fortunately, I know that most of you already know most of this information and are in agreement with me concerning it. 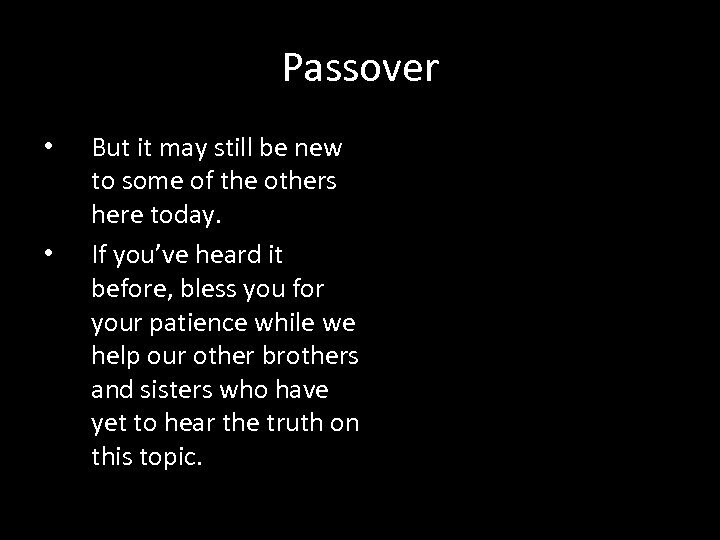 Passover • • But it may still be new to some of the others here today. If you’ve heard it before, bless you for your patience while we help our other brothers and sisters who have yet to hear the truth on this topic. 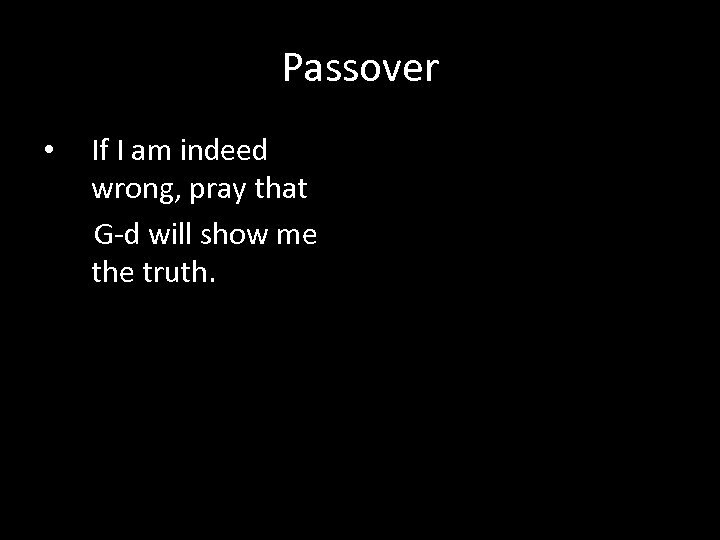 Passover • • If you want to tell me I’m wrong, send me an email or… Set up a time to come and talk to me in private. 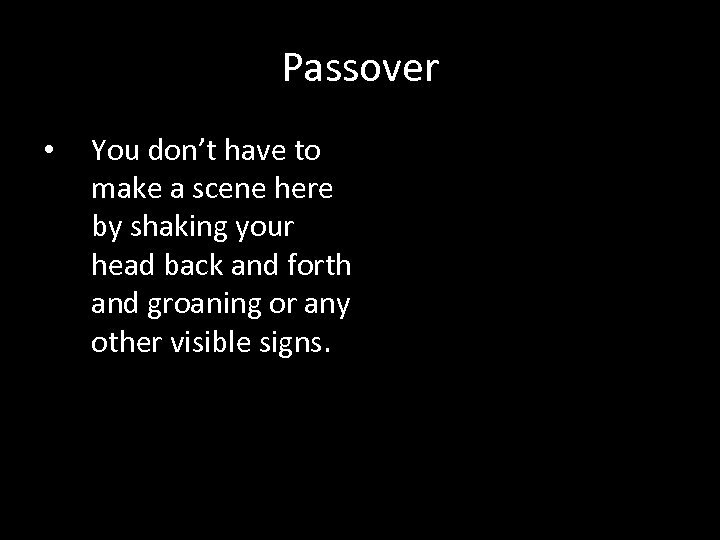 Passover • You don’t have to make a scene here by shaking your head back and forth and groaning or any other visible signs. 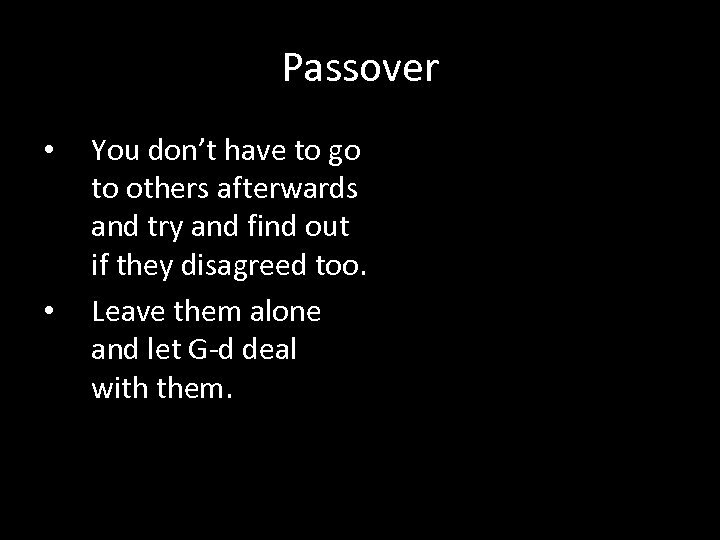 Passover • • You don’t have to go to others afterwards and try and find out if they disagreed too. Leave them alone and let G-d deal with them. 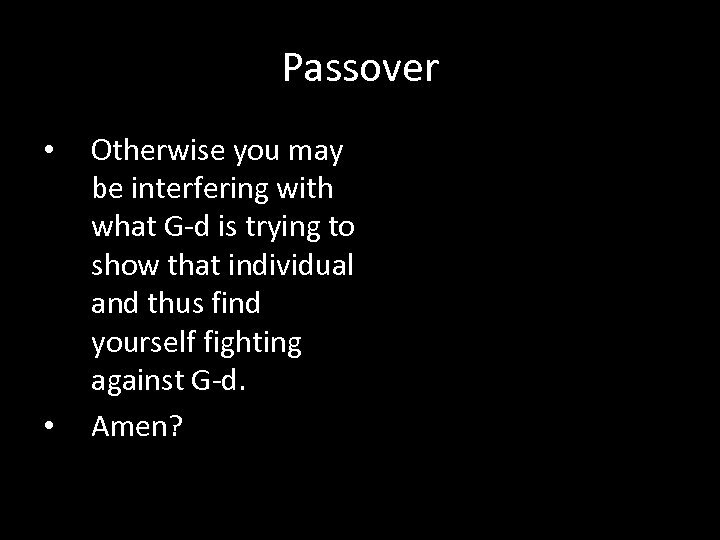 Passover • • Otherwise you may be interfering with what G-d is trying to show that individual and thus find yourself fighting against G-d. Amen? 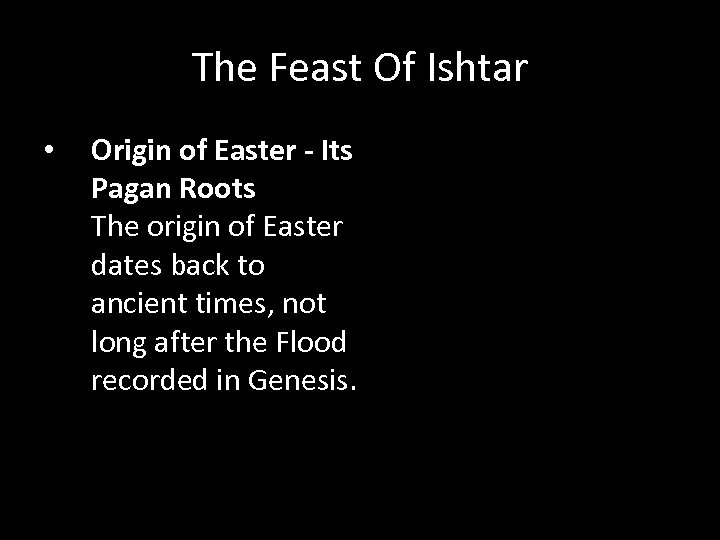 The Feast Of Ishtar • Origin of Easter - Its Pagan Roots The origin of Easter dates back to ancient times, not long after the Flood recorded in Genesis. 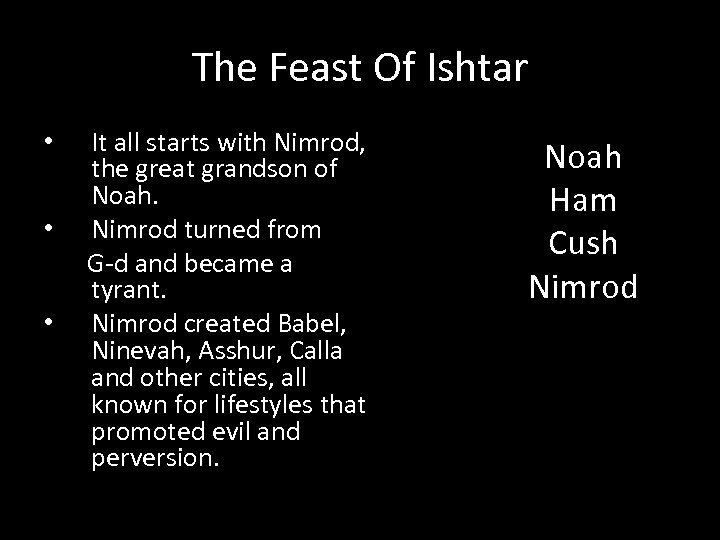 The Feast Of Ishtar • • • Gen 10 8 And Cush begat Nimrod: he began to be a mighty one in the earth. 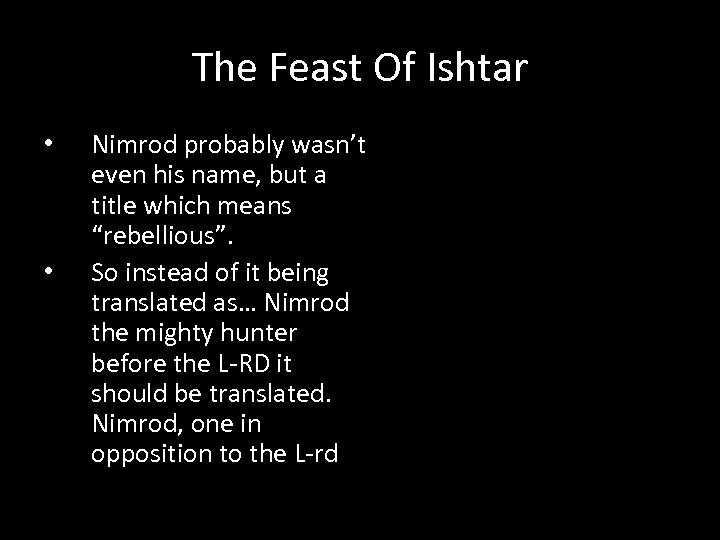 9 He was a mighty hunter before the LORD: wherefore it is said, Even as Nimrod the mighty hunter before the LORD. 10 And the beginning of his kingdom was Babel, and Erech, and Accad, and Calneh, in the land of Shinar. 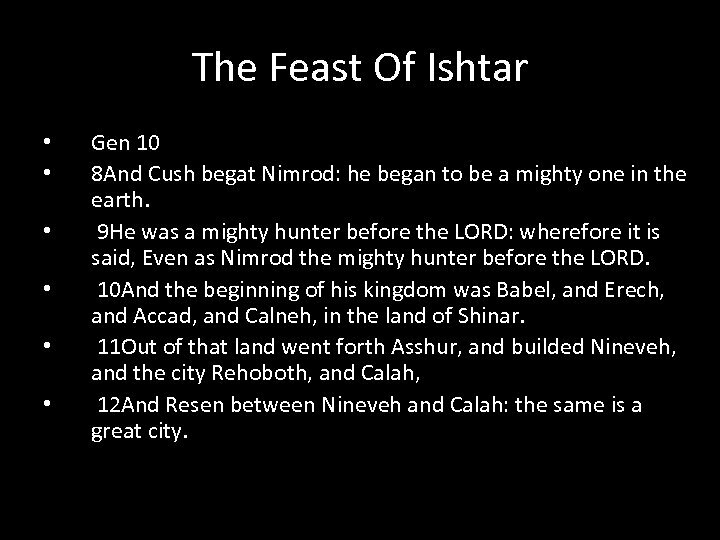 11 Out of that land went forth Asshur, and builded Nineveh, and the city Rehoboth, and Calah, 12 And Resen between Nineveh and Calah: the same is a great city. 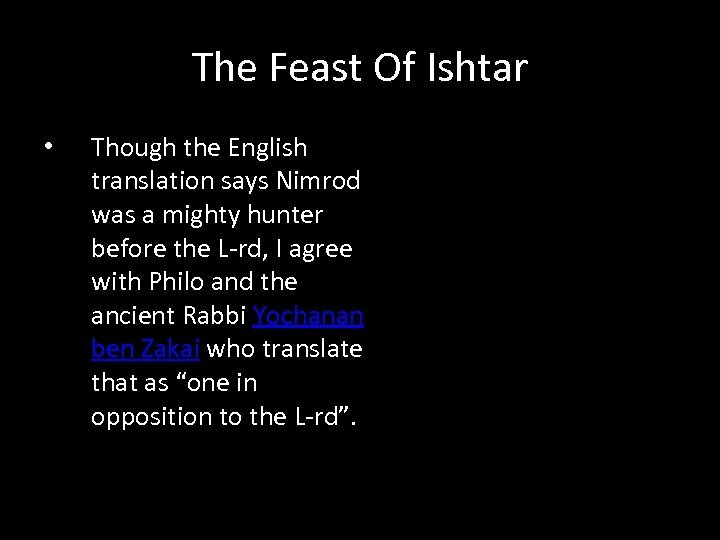 The Feast Of Ishtar • Though the English translation says Nimrod was a mighty hunter before the L-rd, I agree with Philo and the ancient Rabbi Yochanan ben Zakai who translate that as “one in opposition to the L-rd”. 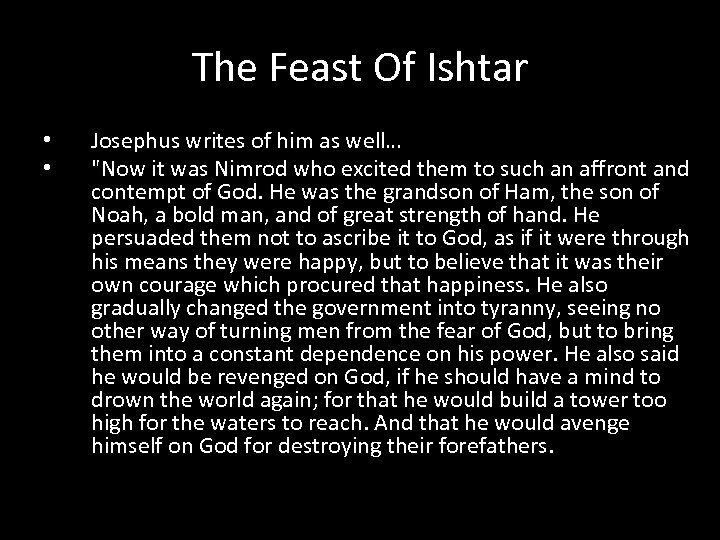 The Feast Of Ishtar • • Josephus writes of him as well… "Now it was Nimrod who excited them to such an affront and contempt of God. He was the grandson of Ham, the son of Noah, a bold man, and of great strength of hand. He persuaded them not to ascribe it to God, as if it were through his means they were happy, but to believe that it was their own courage which procured that happiness. He also gradually changed the government into tyranny, seeing no other way of turning men from the fear of God, but to bring them into a constant dependence on his power. He also said he would be revenged on God, if he should have a mind to drown the world again; for that he would build a tower too high for the waters to reach. And that he would avenge himself on God for destroying their forefathers. 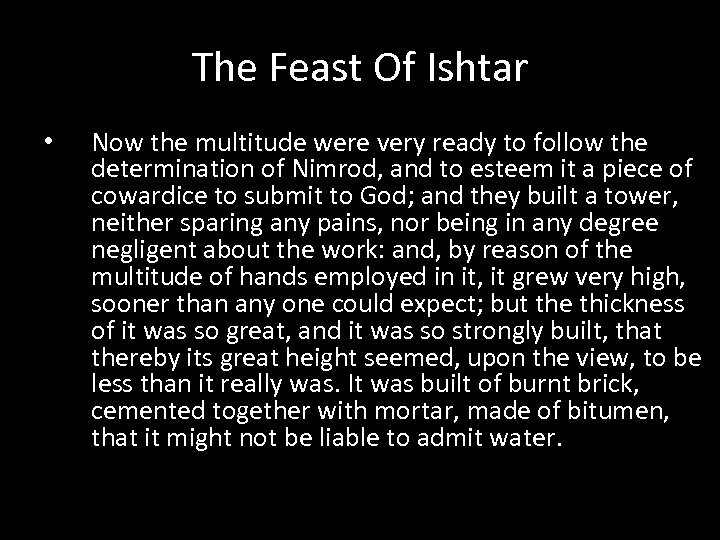 The Feast Of Ishtar • Now the multitude were very ready to follow the determination of Nimrod, and to esteem it a piece of cowardice to submit to God; and they built a tower, neither sparing any pains, nor being in any degree negligent about the work: and, by reason of the multitude of hands employed in it, it grew very high, sooner than any one could expect; but the thickness of it was so great, and it was so strongly built, that thereby its great height seemed, upon the view, to be less than it really was. It was built of burnt brick, cemented together with mortar, made of bitumen, that it might not be liable to admit water. 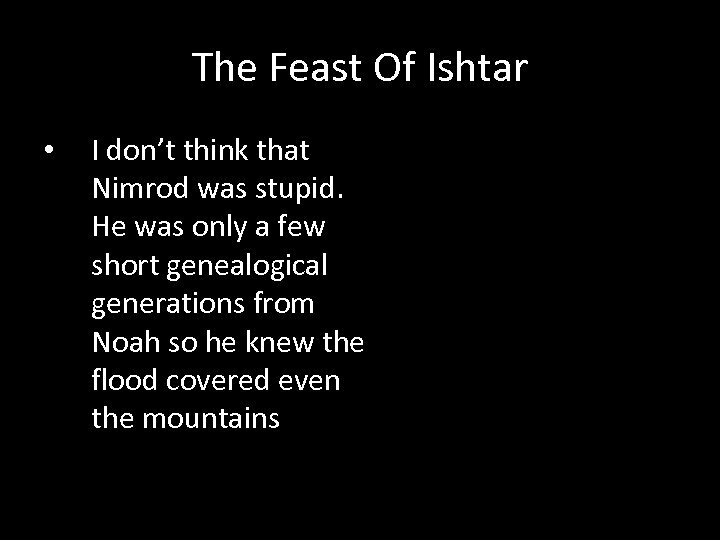 The Feast Of Ishtar • When God saw that they acted so madly, he did not resolve to destroy them utterly, since they were not grown wiser by the destruction of the former sinners; but he caused a tumult among them, by producing in them diverse languages, and causing that, through the multitude of those languages, they should not be able to understand one another. 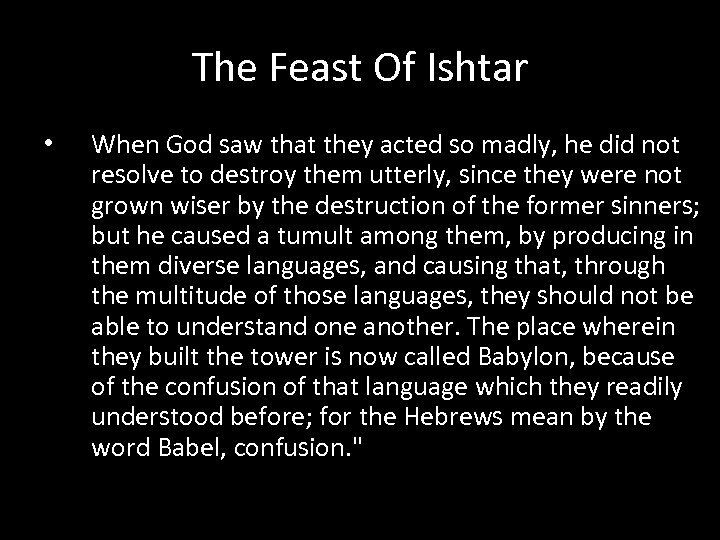 The place wherein they built the tower is now called Babylon, because of the confusion of that language which they readily understood before; for the Hebrews mean by the word Babel, confusion. " 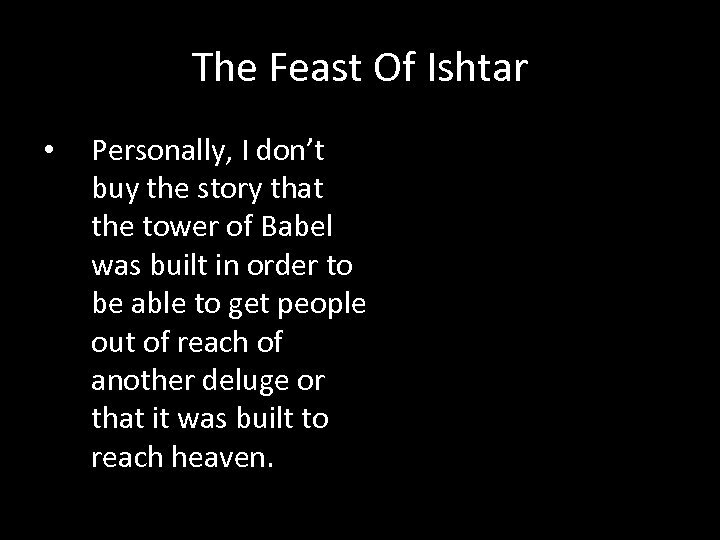 The Feast Of Ishtar • Personally, I don’t buy the story that the tower of Babel was built in order to be able to get people out of reach of another deluge or that it was built to reach heaven. 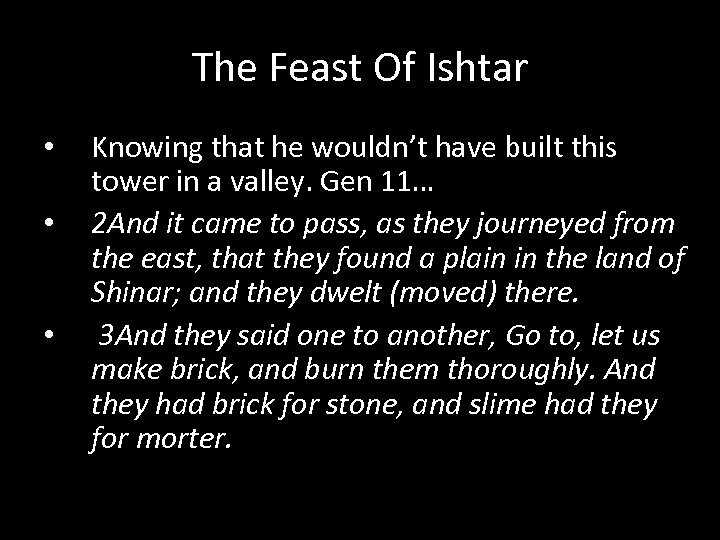 The Feast Of Ishtar • • • Knowing that he wouldn’t have built this tower in a valley. 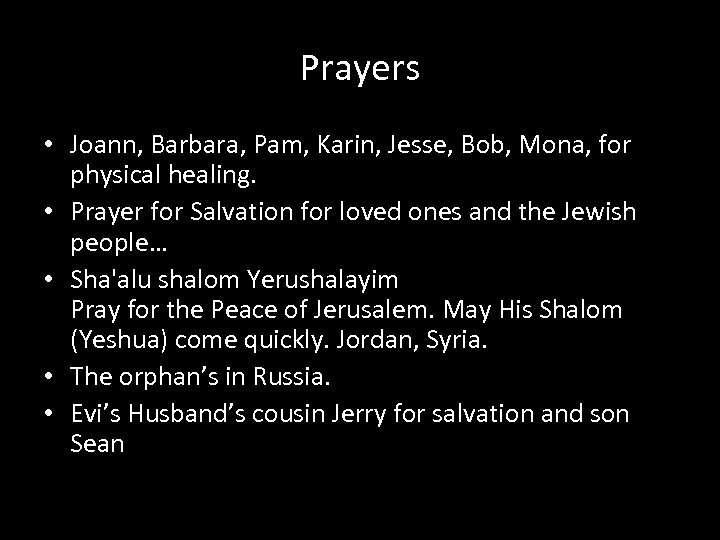 Gen 11… 2 And it came to pass, as they journeyed from the east, that they found a plain in the land of Shinar; and they dwelt (moved) there. 3 And they said one to another, Go to, let us make brick, and burn them thoroughly. And they had brick for stone, and slime had they for morter. 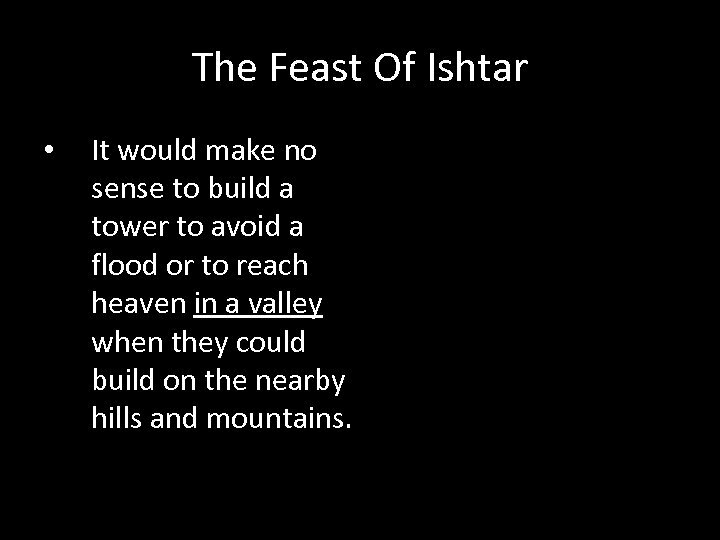 The Feast Of Ishtar • It would make no sense to build a tower to avoid a flood or to reach heaven in a valley when they could build on the nearby hills and mountains. 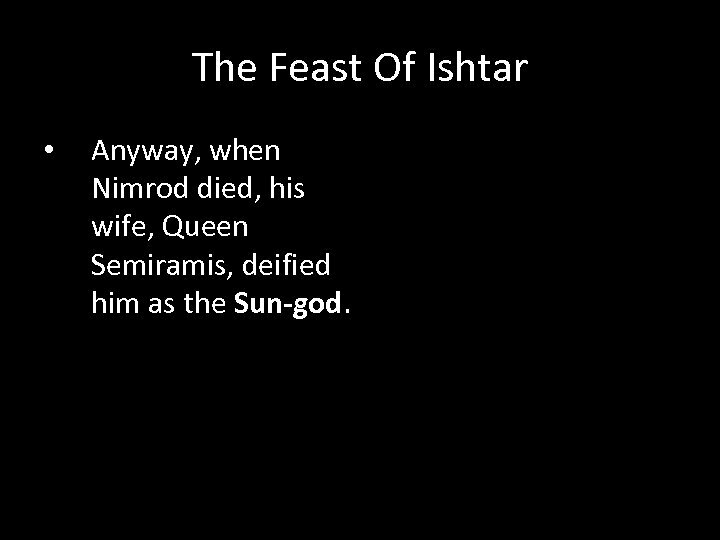 The Feast Of Ishtar • Anyway, when Nimrod died, his wife, Queen Semiramis, deified him as the Sun-god. 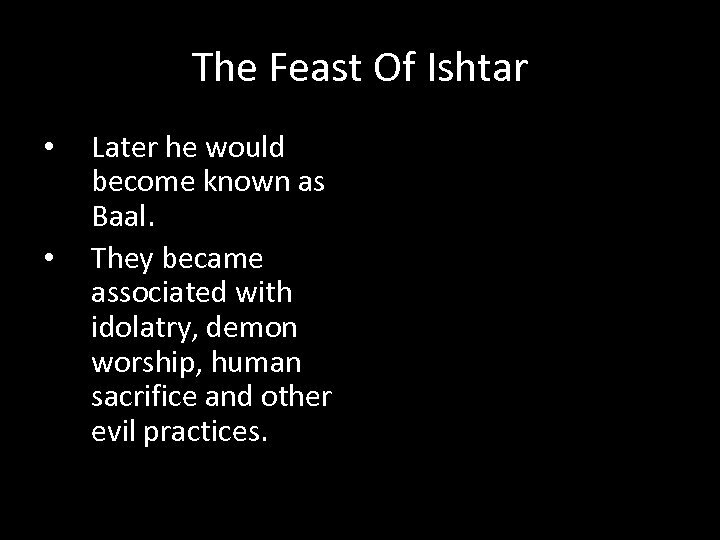 The Feast Of Ishtar • • Later he would become known as Baal. 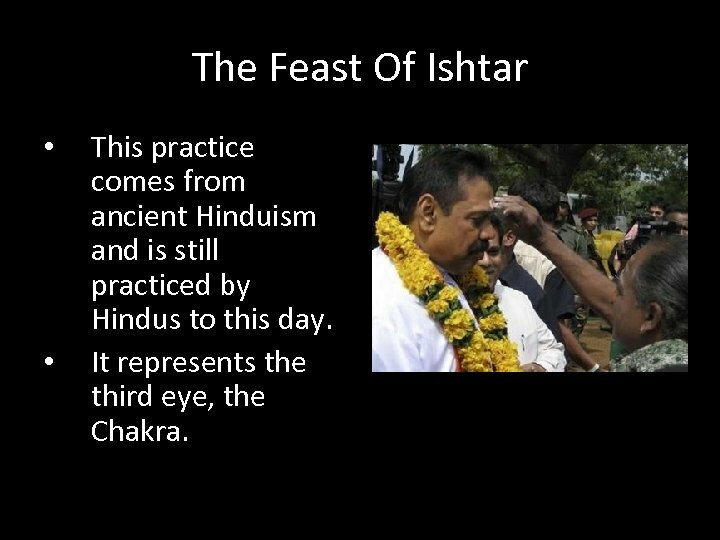 They became associated with idolatry, demon worship, human sacrifice and other evil practices. 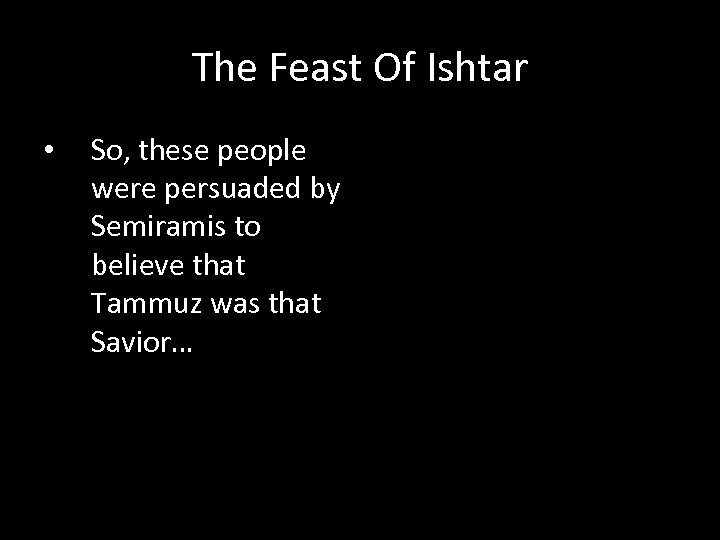 The Feast Of Ishtar • • • After Nimrod died Semiramis had an illegitimate son, Tammuz. 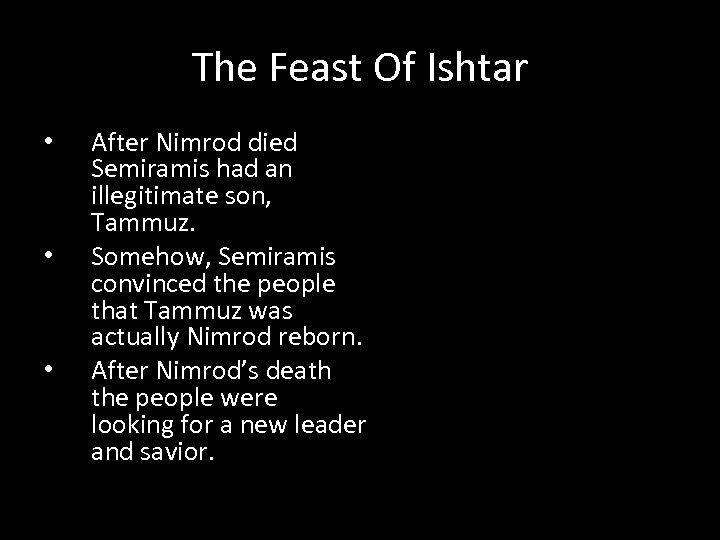 Somehow, Semiramis convinced the people that Tammuz was actually Nimrod reborn. After Nimrod’s death the people were looking for a new leader and savior. 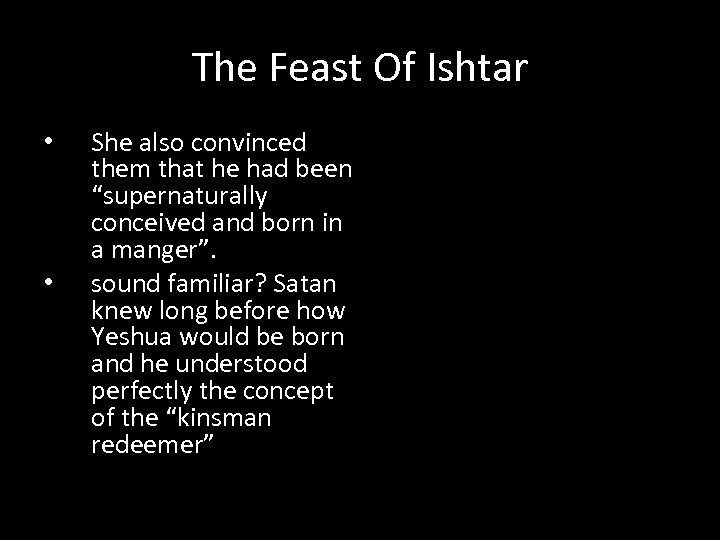 The Feast Of Ishtar • • People had been looking for the promised Savior since the beginning of mankind. 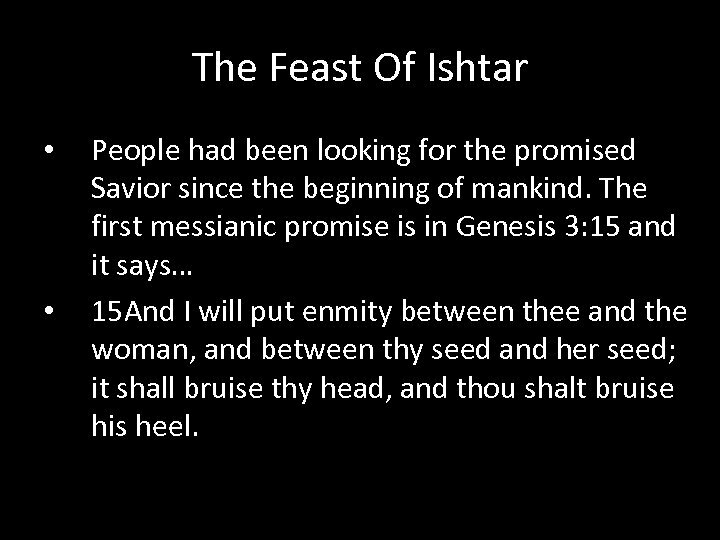 The first messianic promise is in Genesis 3: 15 and it says… 15 And I will put enmity between thee and the woman, and between thy seed and her seed; it shall bruise thy head, and thou shalt bruise his heel. 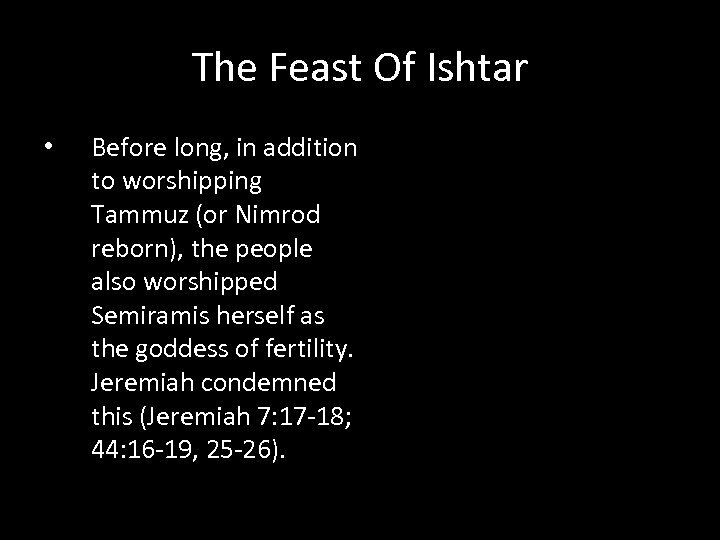 The Feast Of Ishtar • Before long, in addition to worshipping Tammuz (or Nimrod reborn), the people also worshipped Semiramis herself as the goddess of fertility. 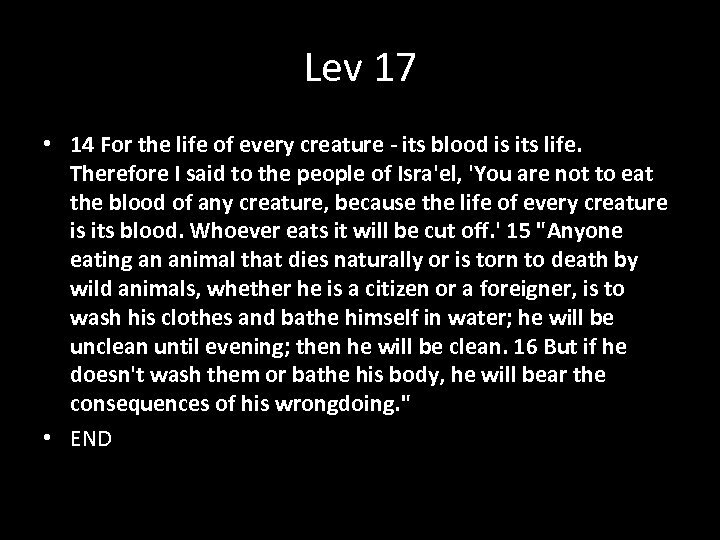 Jeremiah condemned this (Jeremiah 7: 17 -18; 44: 16 -19, 25 -26). 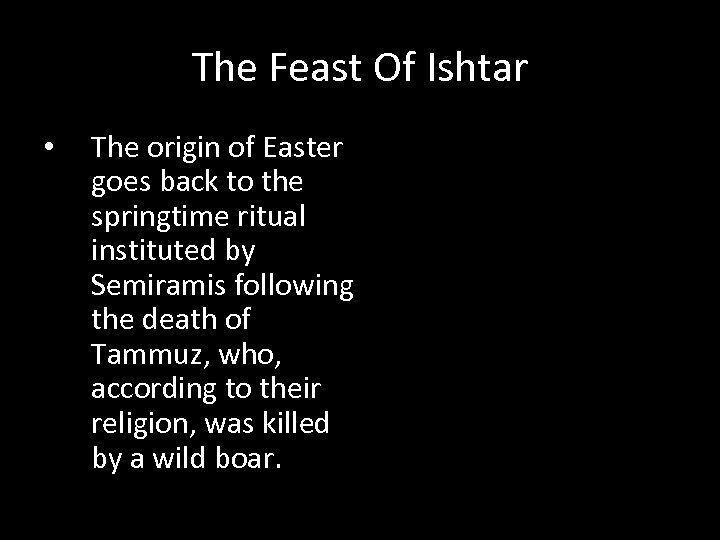 The Feast Of Ishtar • The origin of Easter goes back to the springtime ritual instituted by Semiramis following the death of Tammuz, who, according to their religion, was killed by a wild boar. 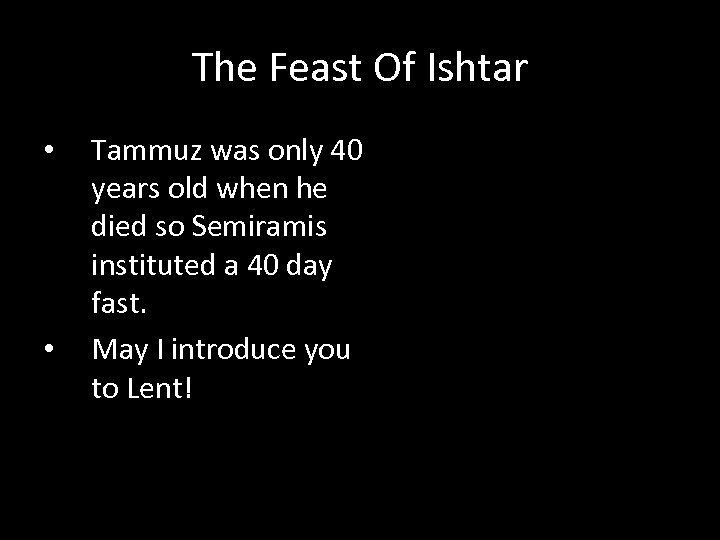 The Feast Of Ishtar • • Tammuz was only 40 years old when he died so Semiramis instituted a 40 day fast. 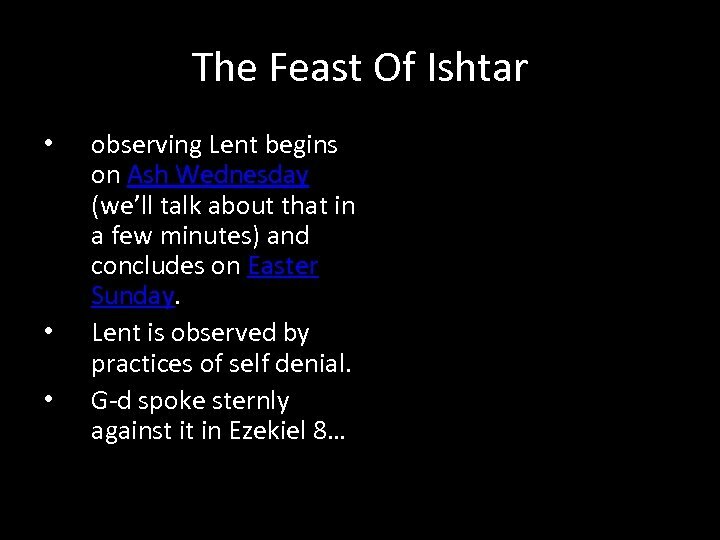 May I introduce you to Lent! 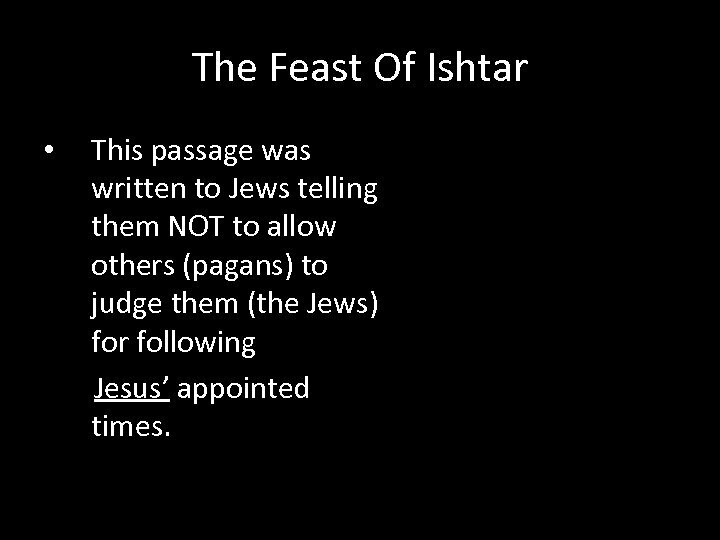 The Feast Of Ishtar • • Ez 8: 13, 18 13 He said also unto me, Turn thee yet again, and thou shalt see greater abominations that they do. 14 Then he brought me to the door of the gate of the LORD's house which was toward the north; and, behold, there sat women weeping for Tammuz. 18 Therefore will I also deal in fury: mine eye shall not spare, neither will I have pity: and though they cry in mine ears with a loud voice, yet will I not hear them. 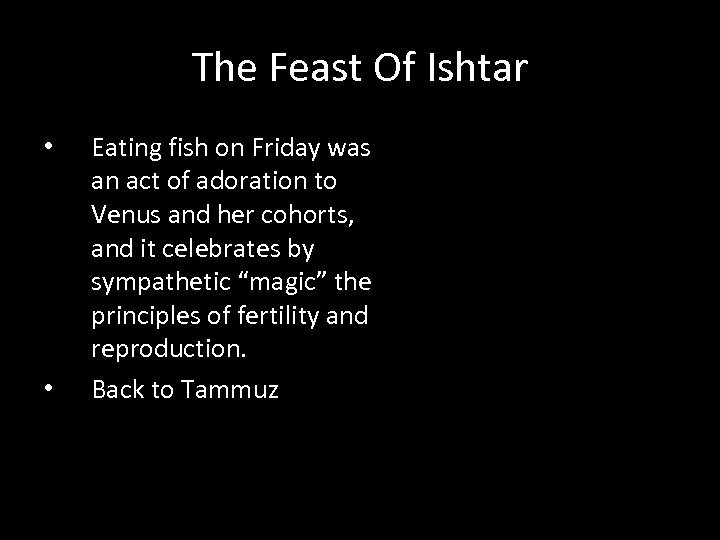 The Feast Of Ishtar • • • On Fridays during lent Catholics eat fish… Where did this pagan custom originate? 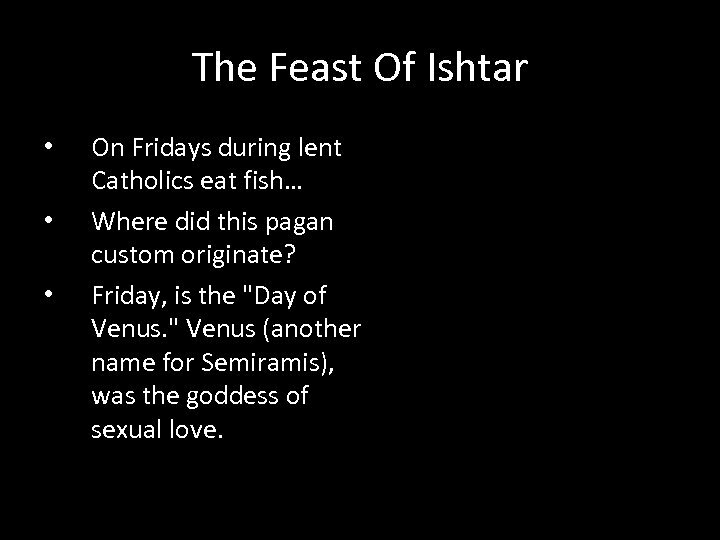 Friday, is the "Day of Venus. " Venus (another name for Semiramis), was the goddess of sexual love. 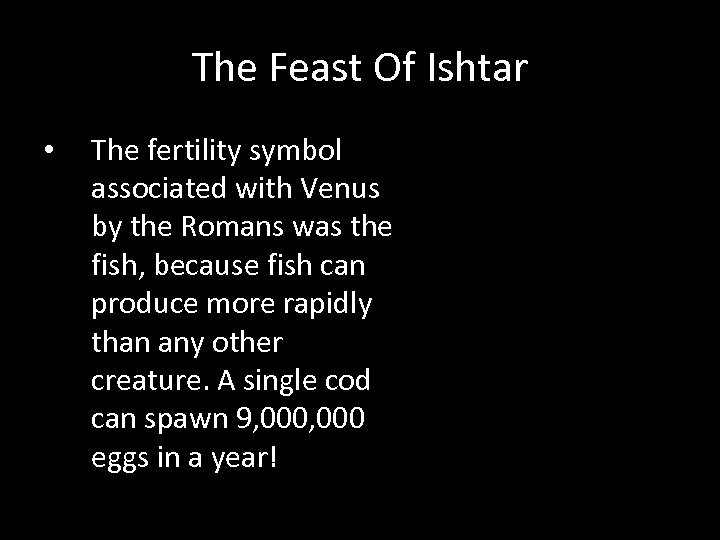 The Feast Of Ishtar • The fertility symbol associated with Venus by the Romans was the fish, because fish can produce more rapidly than any other creature. A single cod can spawn 9, 000 eggs in a year! 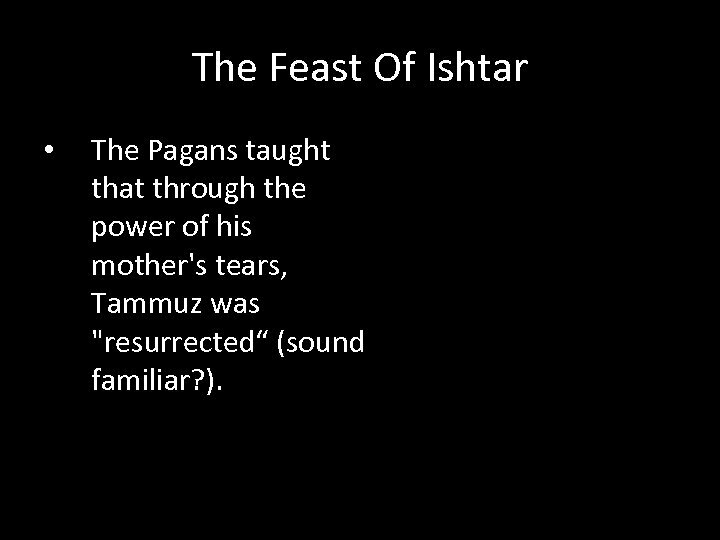 The Feast Of Ishtar • The Pagans taught that through the power of his mother's tears, Tammuz was "resurrected“ (sound familiar? ). 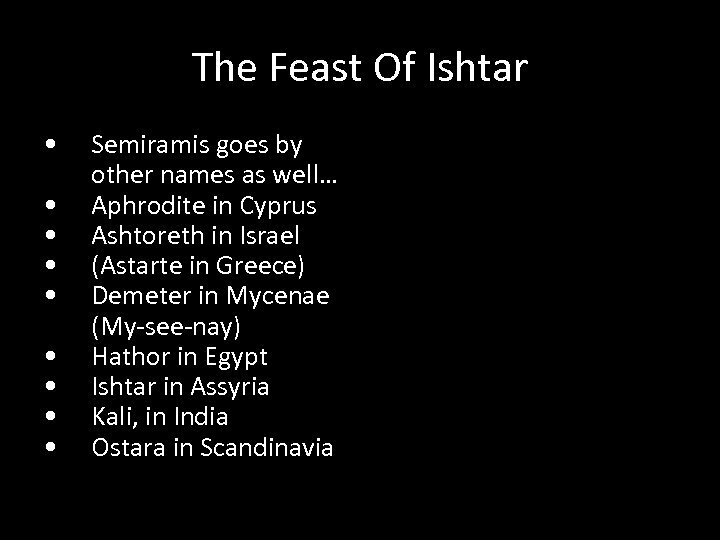 The Feast Of Ishtar • There anti. 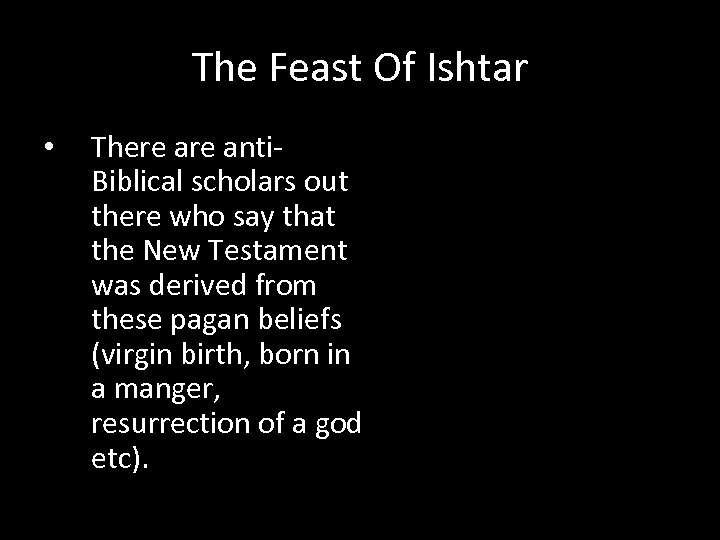 Biblical scholars out there who say that the New Testament was derived from these pagan beliefs (virgin birth, born in a manger, resurrection of a god etc). 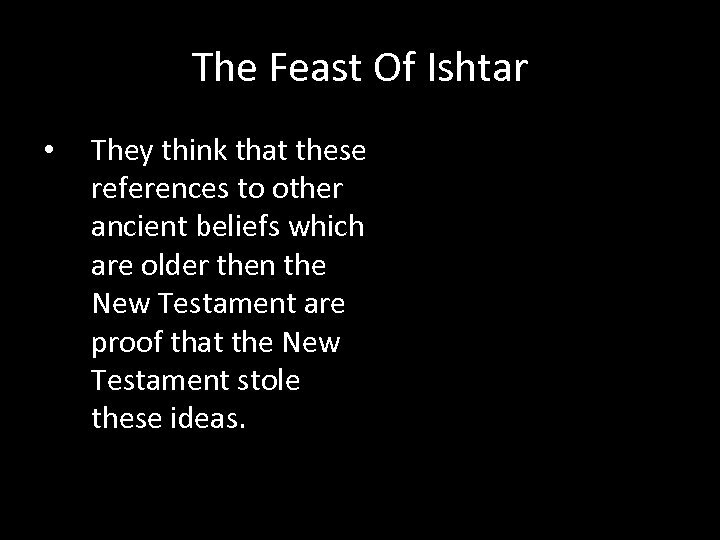 The Feast Of Ishtar • They think that these references to other ancient beliefs which are older then the New Testament are proof that the New Testament stole these ideas. 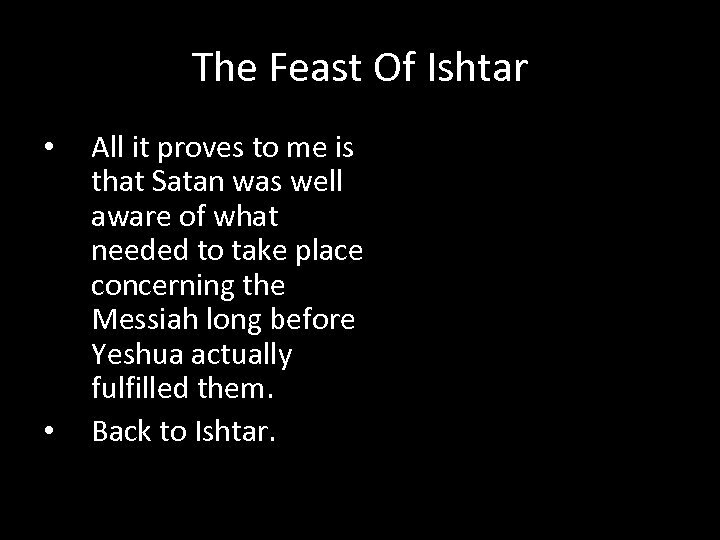 The Feast Of Ishtar • • All it proves to me is that Satan was well aware of what needed to take place concerning the Messiah long before Yeshua actually fulfilled them. 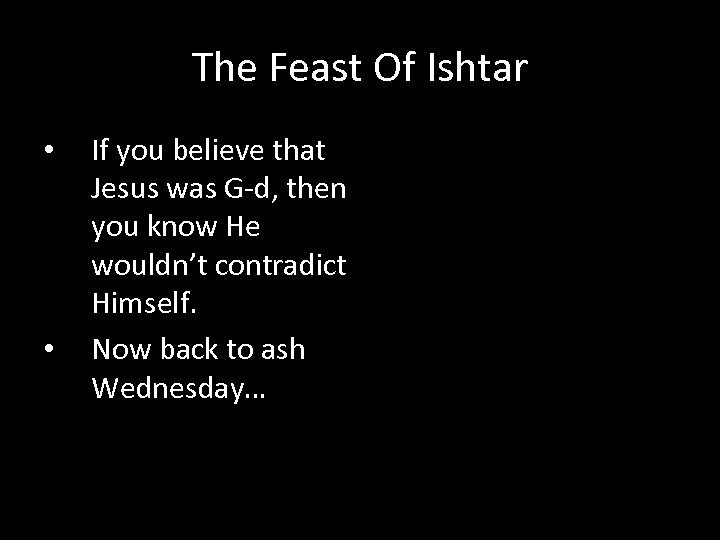 Back to Ishtar. 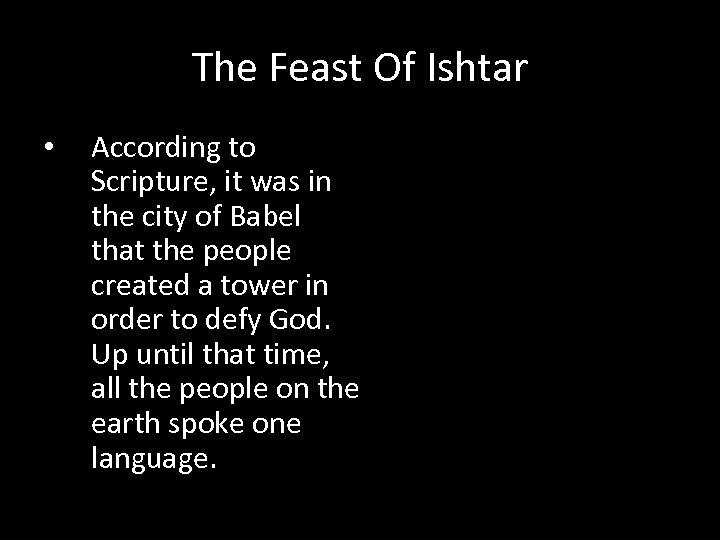 The Feast Of Ishtar • According to Scripture, it was in the city of Babel that the people created a tower in order to defy God. Up until that time, all the people on the earth spoke one language. 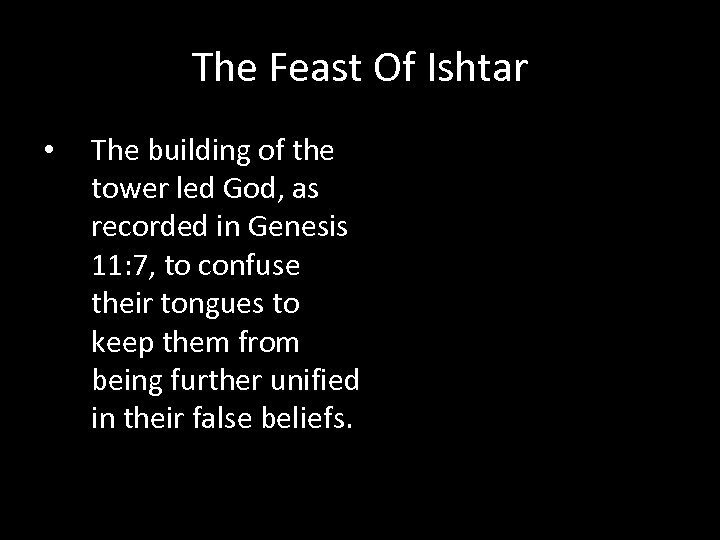 The Feast Of Ishtar • The building of the tower led God, as recorded in Genesis 11: 7, to confuse their tongues to keep them from being further unified in their false beliefs. 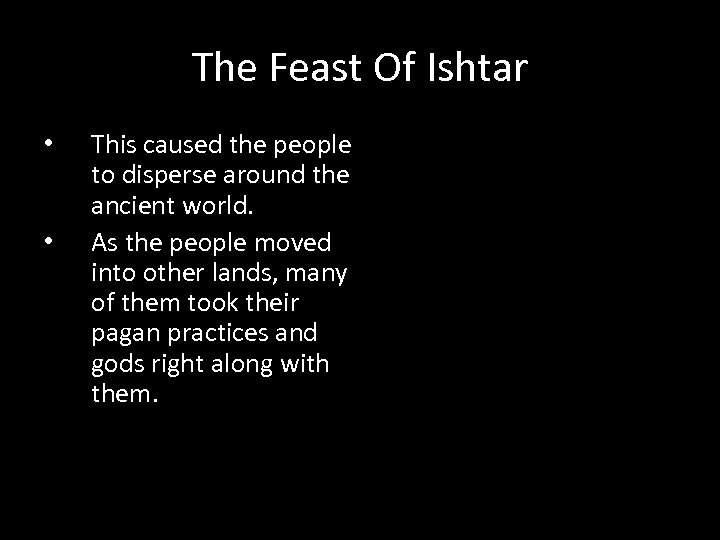 The Feast Of Ishtar • • This caused the people to disperse around the ancient world. As the people moved into other lands, many of them took their pagan practices and gods right along with them. 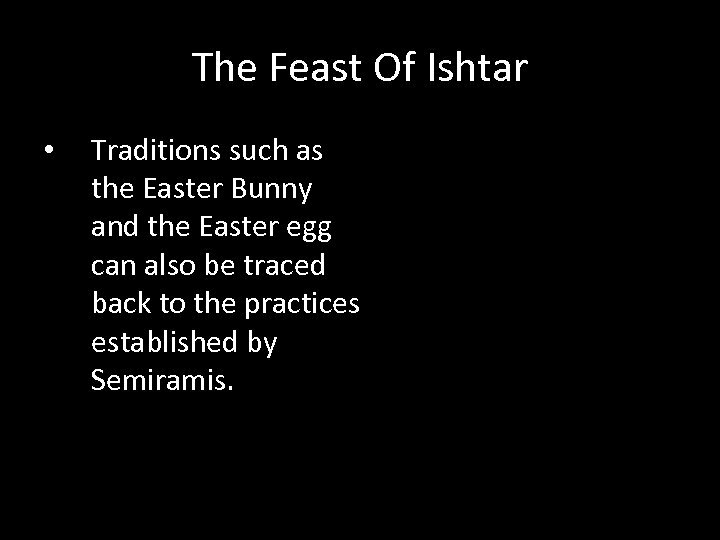 The Feast Of Ishtar • Traditions such as the Easter Bunny and the Easter egg can also be traced back to the practices established by Semiramis. 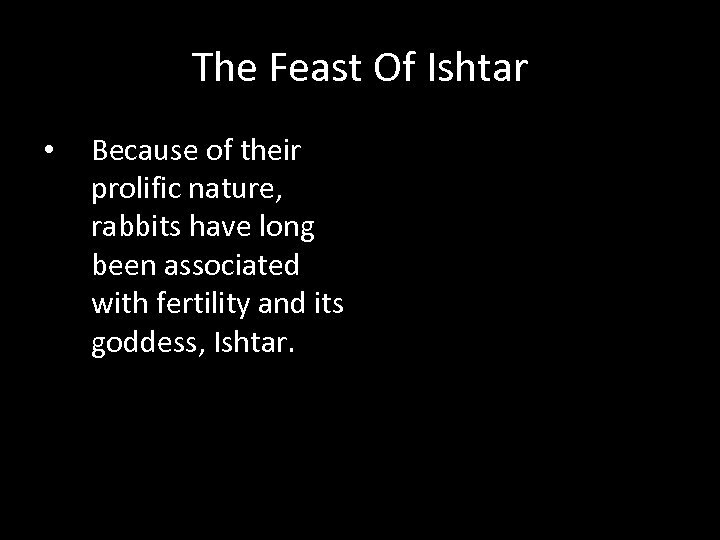 The Feast Of Ishtar • Because of their prolific nature, rabbits have long been associated with fertility and its goddess, Ishtar. 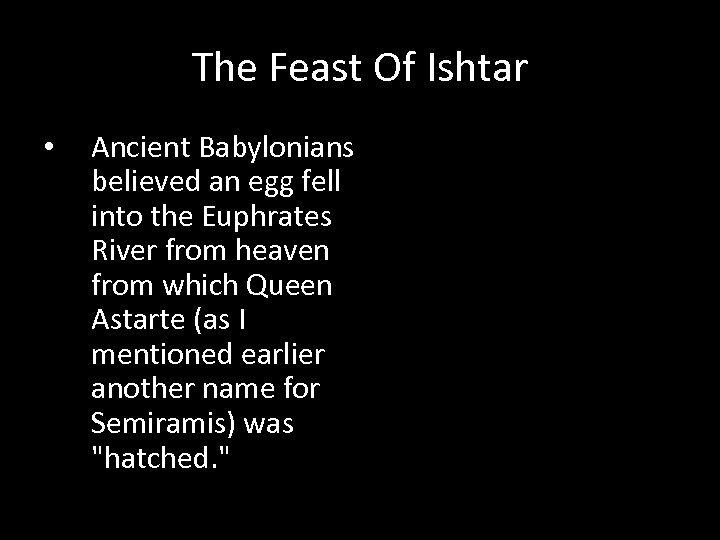 The Feast Of Ishtar • Ancient Babylonians believed an egg fell into the Euphrates River from heaven from which Queen Astarte (as I mentioned earlier another name for Semiramis) was "hatched. " 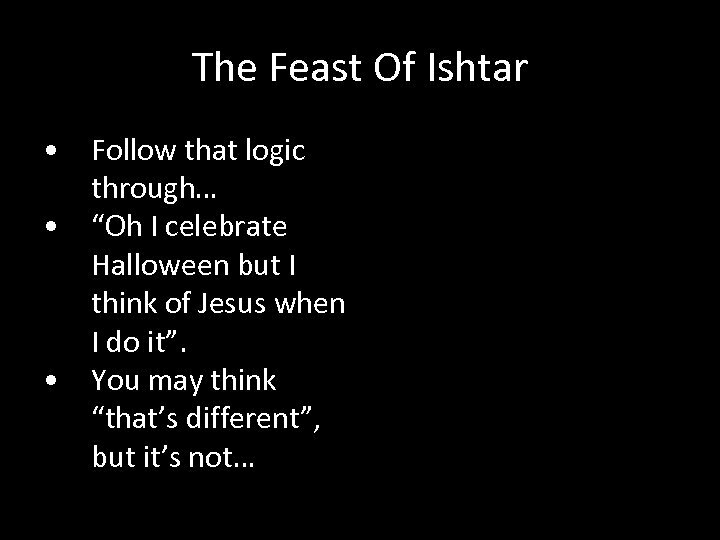 The Feast Of Ishtar • All the same god. 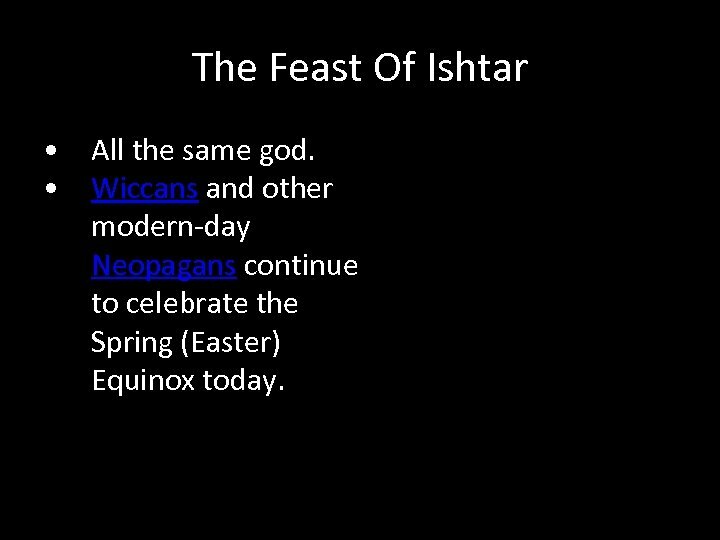 • Wiccans and other modern-day Neopagans continue to celebrate the Spring (Easter) Equinox today. 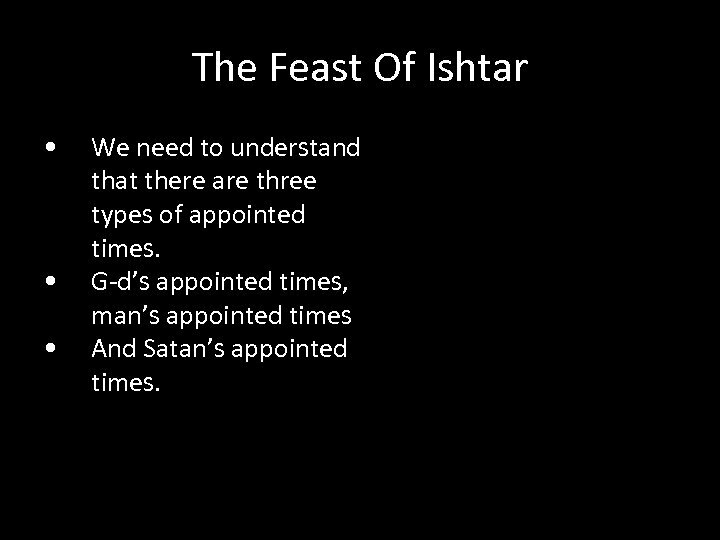 The Feast Of Ishtar • • • We need to understand that there are three types of appointed times. G-d’s appointed times, man’s appointed times And Satan’s appointed times. 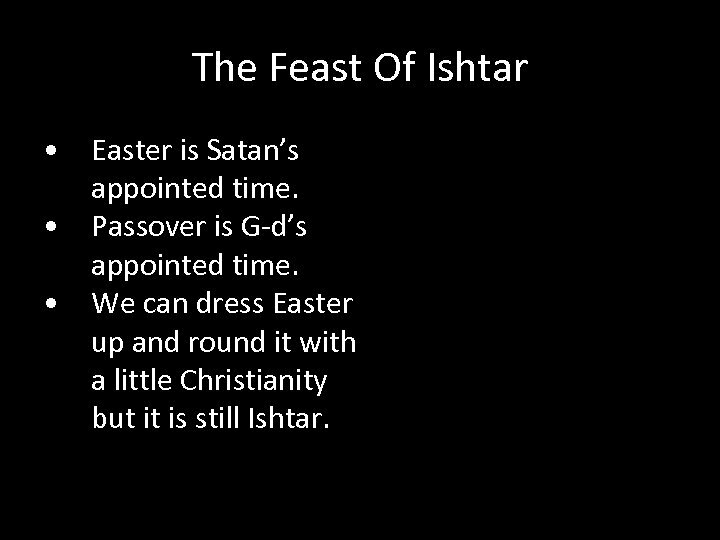 The Feast Of Ishtar • Easter is Satan’s appointed time. 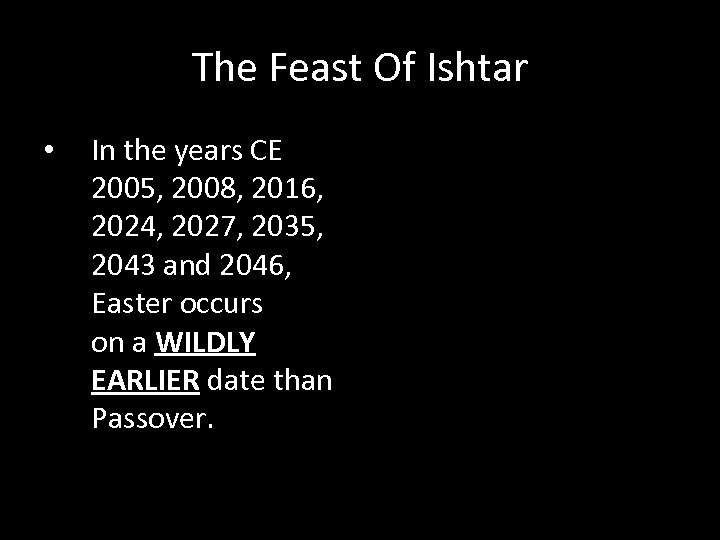 • Passover is G-d’s appointed time. 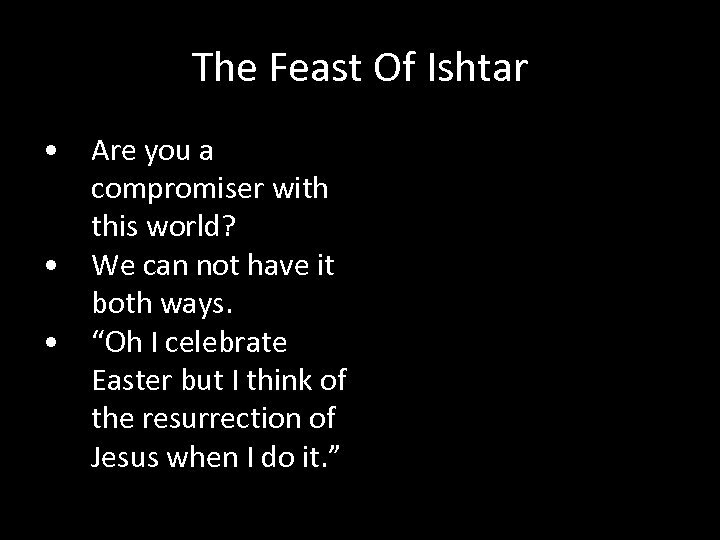 • We can dress Easter up and round it with a little Christianity but it is still Ishtar. 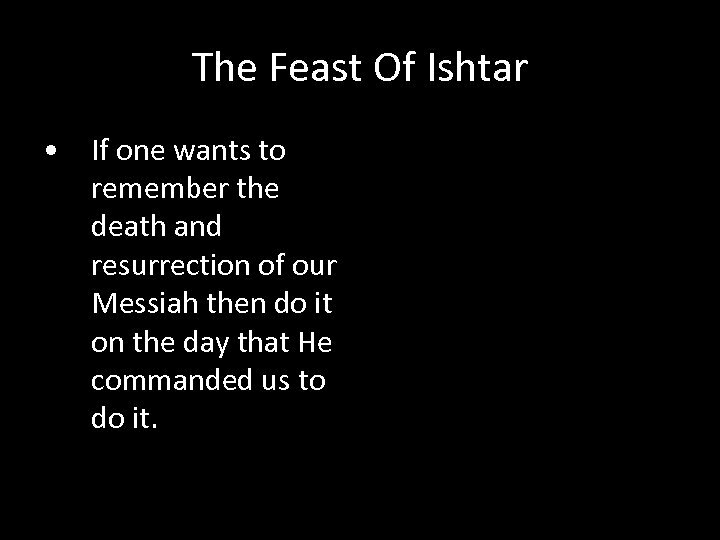 The Feast Of Ishtar • If one wants to remember the death and resurrection of our Messiah then do it on the day that He commanded us to do it. 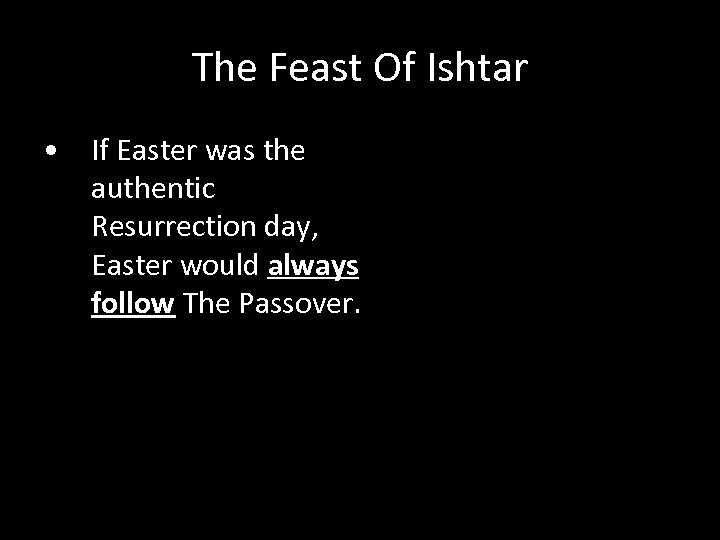 The Feast Of Ishtar • If Easter was the authentic Resurrection day, Easter would always follow The Passover. 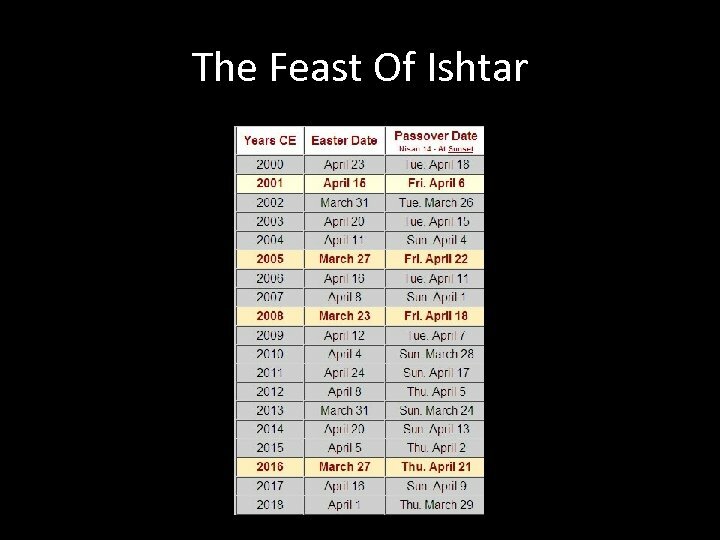 The Feast Of Ishtar • In the years CE 2005, 2008, 2016, 2024, 2027, 2035, 2043 and 2046, Easter occurs on a WILDLY EARLIER date than Passover. 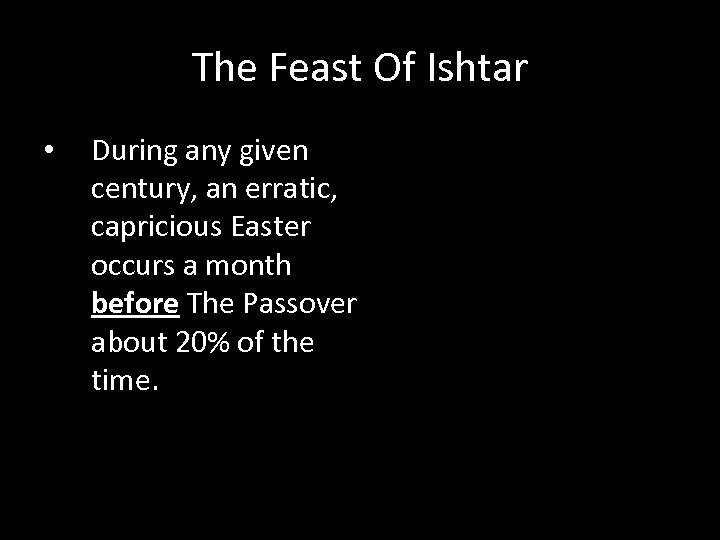 The Feast Of Ishtar • During any given century, an erratic, capricious Easter occurs a month before The Passover about 20% of the time. 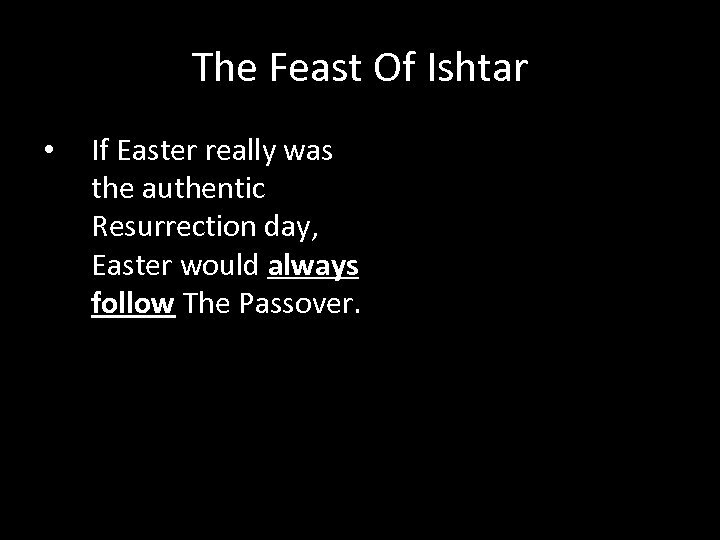 The Feast Of Ishtar • If Easter really was the authentic Resurrection day, Easter would always follow The Passover. 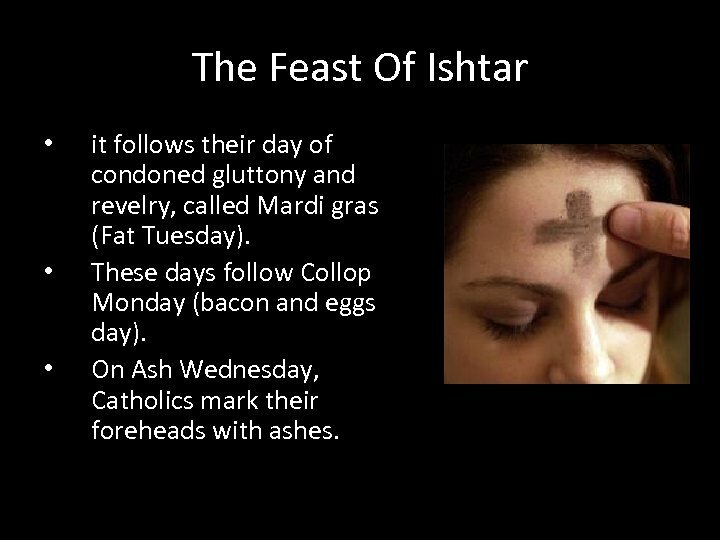 The Feast Of Ishtar • • • it follows their day of condoned gluttony and revelry, called Mardi gras (Fat Tuesday). These days follow Collop Monday (bacon and eggs day). 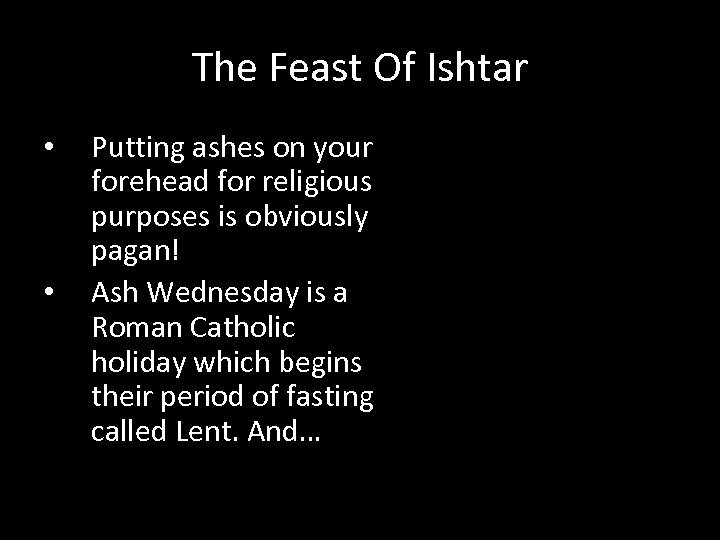 On Ash Wednesday, Catholics mark their foreheads with ashes. 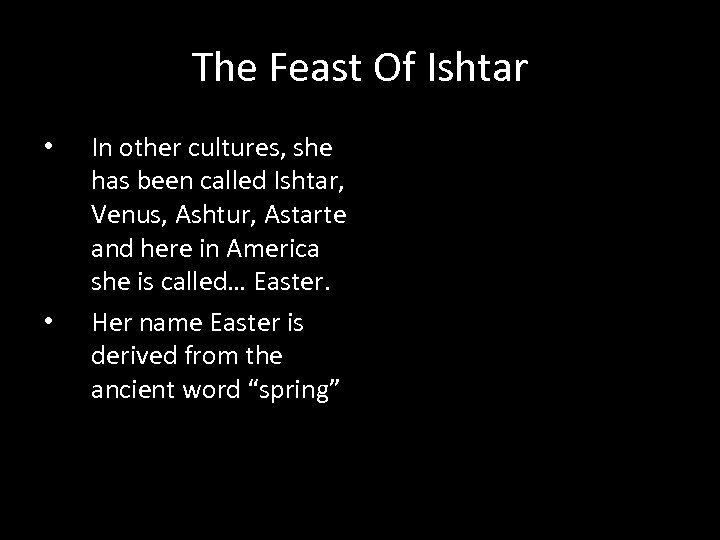 The Feast Of Ishtar • • This practice comes from ancient Hinduism and is still practiced by Hindus to this day. It represents the third eye, the Chakra. 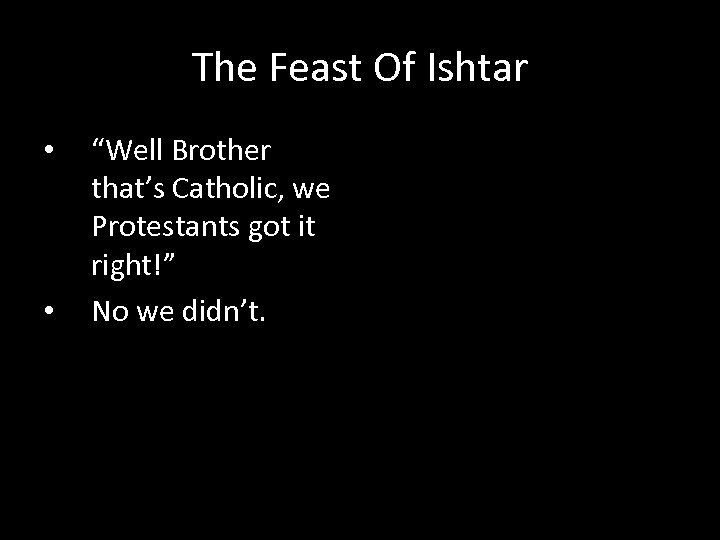 The Feast Of Ishtar • • “Well Brother that’s Catholic, we Protestants got it right!” No we didn’t. Easter Sunrise Service • • EZ 8 15 Then said he unto me, Hast thou seen this, O son of man? turn thee yet again, and thou shalt see greater abominations than these. 16 And he brought me into the inner court of the LORD's house, and, behold, at the door of the temple of the LORD, between the porch and the altar, were about five and twenty men, with their backs toward the temple of the LORD, and their faces toward the east; and they worshipped the sun toward the east. 17 Then he said unto me, Hast thou seen this, O son of man? 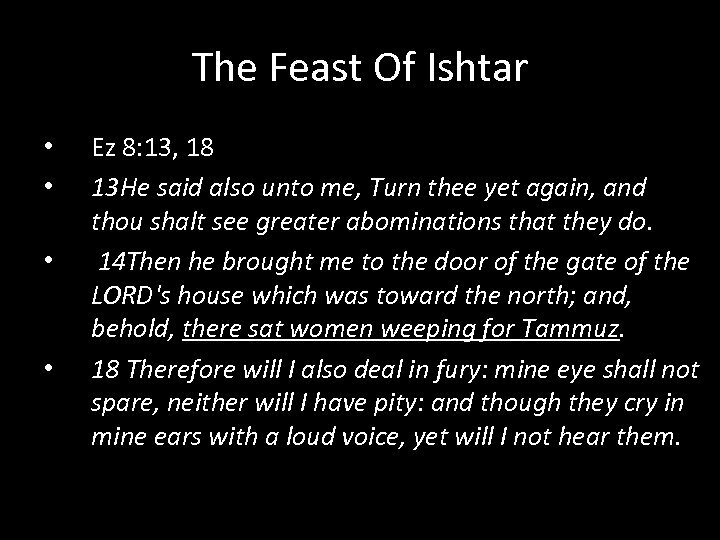 Is it a light thing to the house of Judah that they commit the abominations which they commit here? 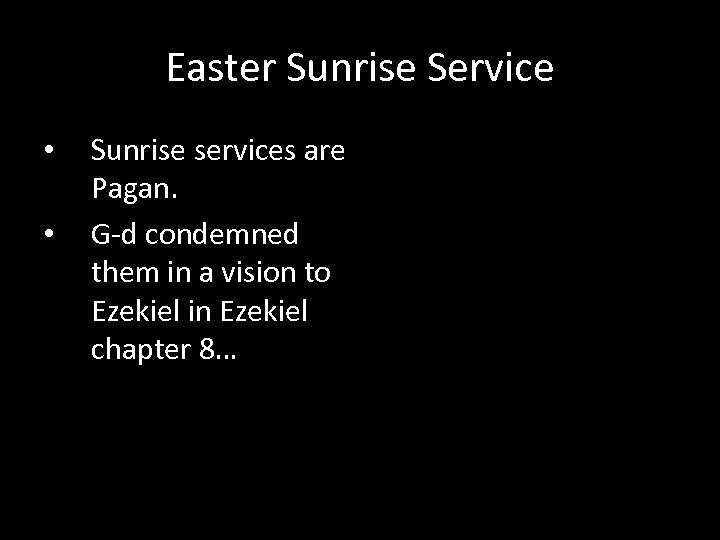 Easter Sunrise Service • • • As I mentioned before Nimrod (AKA Baal) was the Sun god. 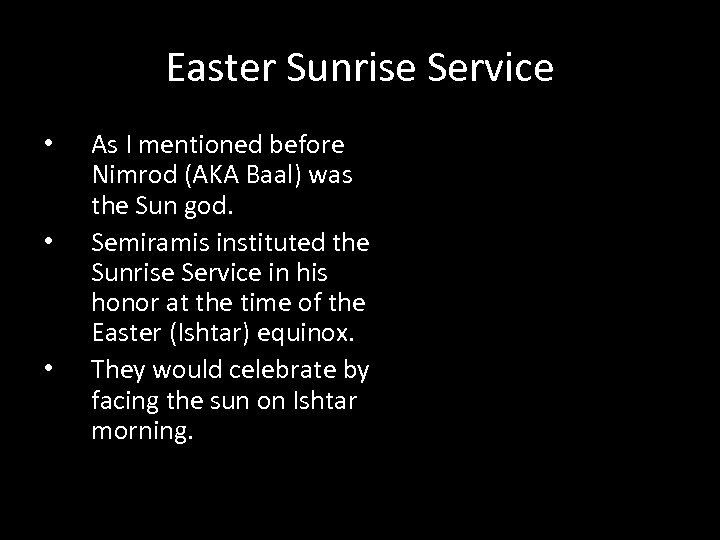 Semiramis instituted the Sunrise Service in his honor at the time of the Easter (Ishtar) equinox. 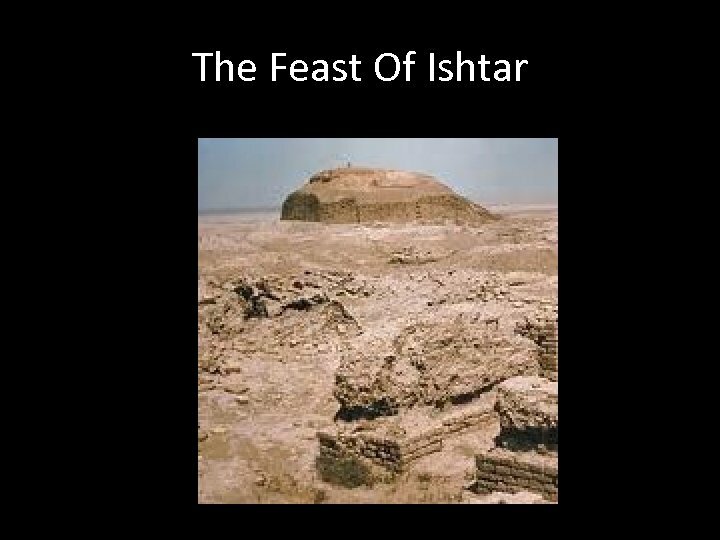 They would celebrate by facing the sun on Ishtar morning. 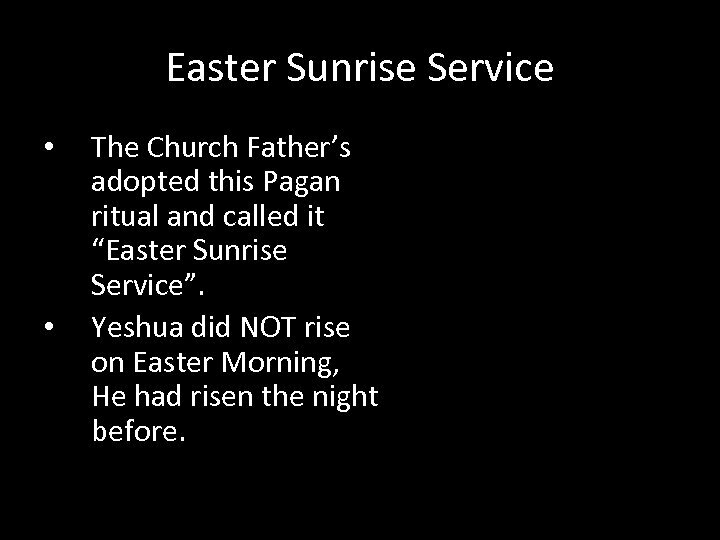 Easter Sunrise Service • • The Church Father’s adopted this Pagan ritual and called it “Easter Sunrise Service”. Yeshua did NOT rise on Easter Morning, He had risen the night before. 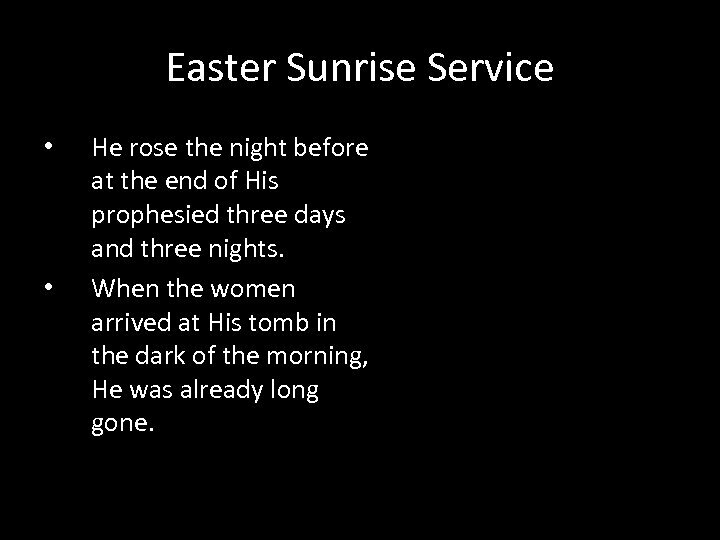 Easter Sunrise Service • • He rose the night before at the end of His prophesied three days and three nights. When the women arrived at His tomb in the dark of the morning, He was already long gone. Easter Sunrise Service • • • Why do I say in the dark of the night? Matthew 28: 1 In the end of the sabbath, as it began to dawn toward the first day of the week, came Mary Magdalene and the other Mary to see the sepulchre. 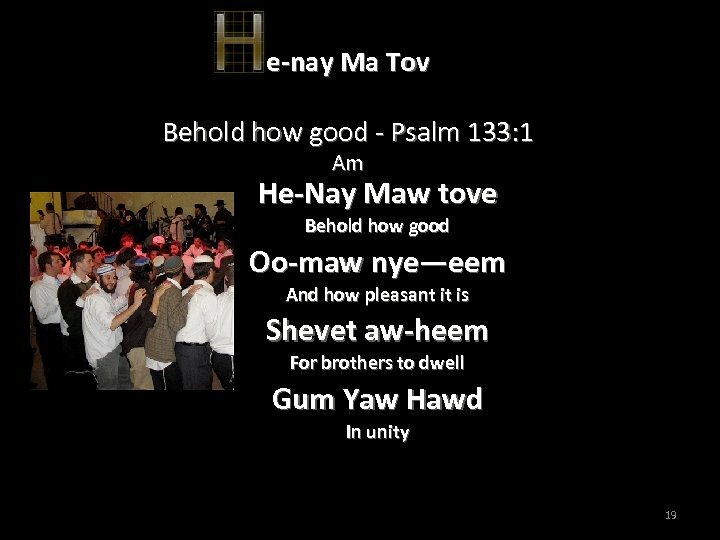 The end of the Sabbath would be our Saturday night at sundown as that day began to dawn (dawn in Greek and hebrew means beginning! 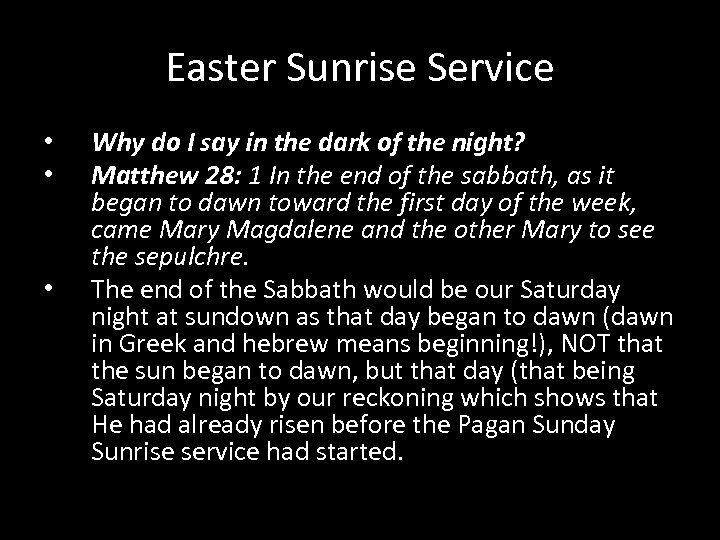 ), NOT that the sun began to dawn, but that day (that being Saturday night by our reckoning which shows that He had already risen before the Pagan Sunday Sunrise service had started. 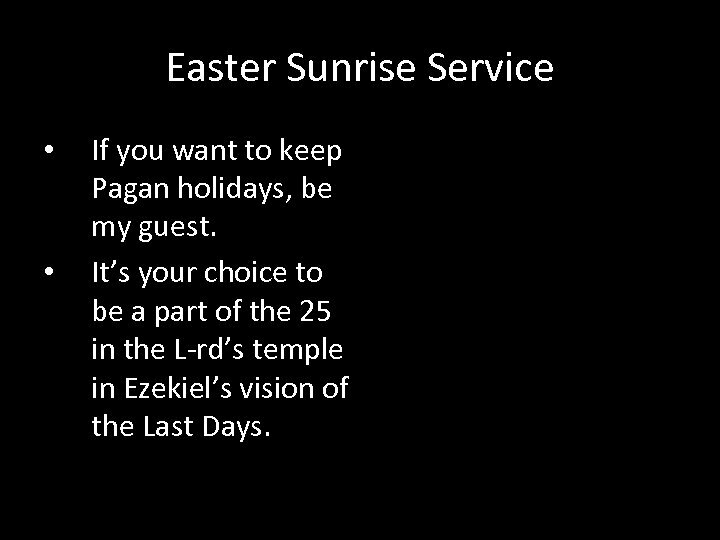 Easter Sunrise Service • • If you want to keep Pagan holidays, be my guest. It’s your choice to be a part of the 25 in the L-rd’s temple in Ezekiel’s vision of the Last Days. 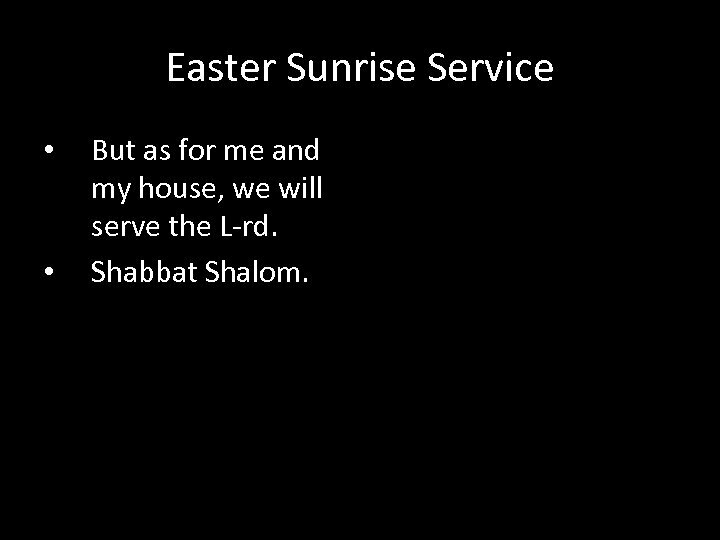 Easter Sunrise Service • • But as for me and my house, we will serve the L-rd. Shabbat Shalom.